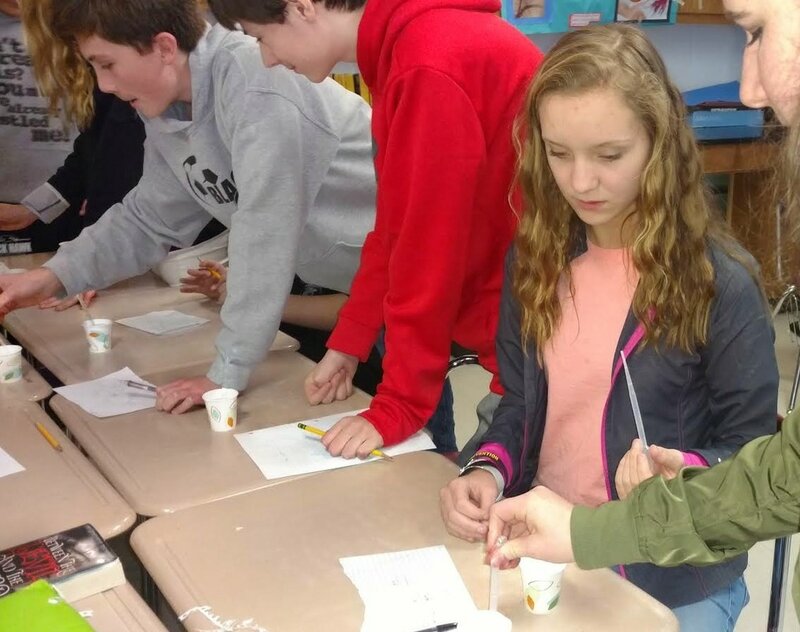 "8th grade Foods and Nutriton students at Valley Springs try their hand in the kitchen after researching and learning how the body utilizes nutrients. 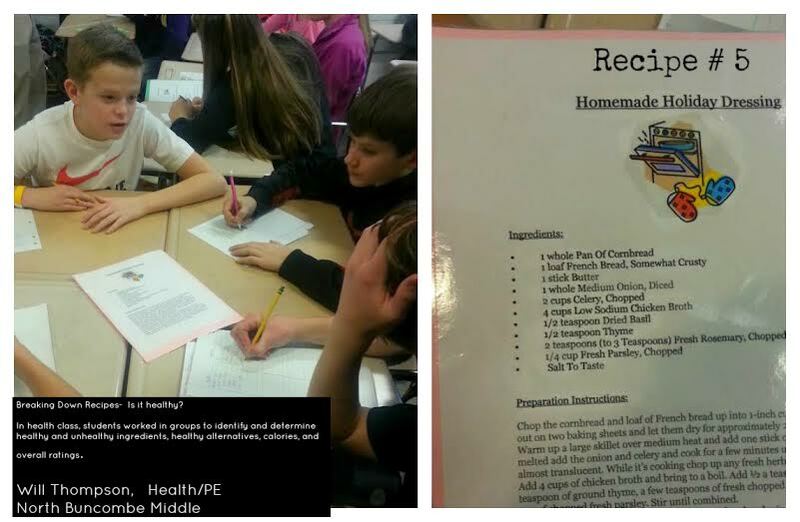 These students prepared a healthy blueberry muffin recipe and then analyzed the nutritional value. 7th grade Childcare students are working to earn their Red Cross Babysitter certification. 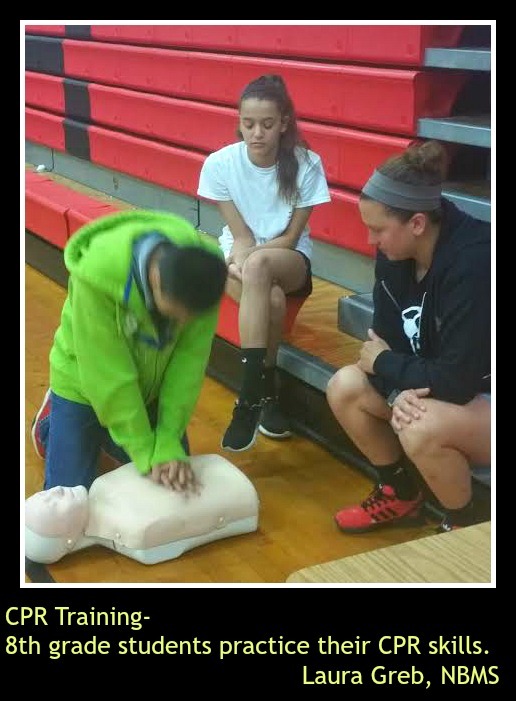 They are learning how to asses victims and determine what first aid they need to provide." "I use tickets to reward positive behavior, hard work, effort, and participation. This helps student motivation because it provides them with an incentive to work hard every day. When they are displaying positive behavior, I hand them a ticket. They write their names on the back of a ticket and I put them in a container. We have a drawing every Friday. They can choose a reward such as a pencil, homework pass, music pass, candy, etc. 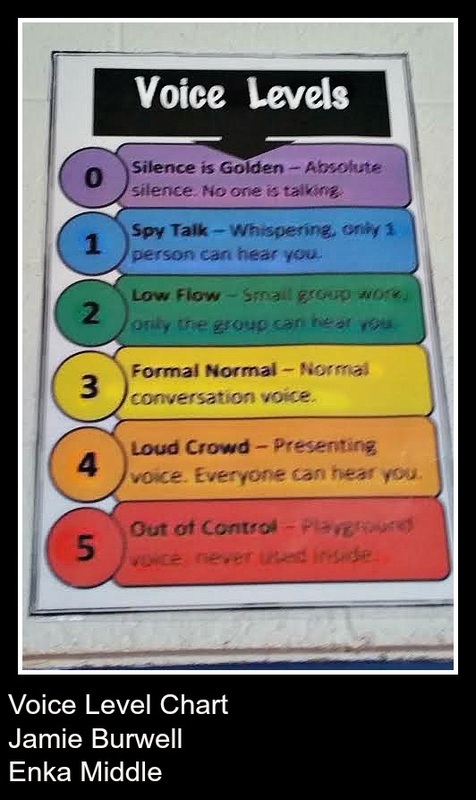 This also helps me keep myself accountable for moving around the room, talking to students, and checking their work throughout each class. I have found that it has been a game-changer!" "I love the game of Sudoku and so I chose to turn one of my bulletin boards into a Sudoku game. Students are able to add numbers to the puzzle and work to complete it as a team. Sudoku solving, trains your mind to process various forms of information, details, images and strategies at lightening speeds. While you devise strategies to win the game, it also builds your neural connections. It helps in extending dendrite connections in your brain cells which help improve memory. 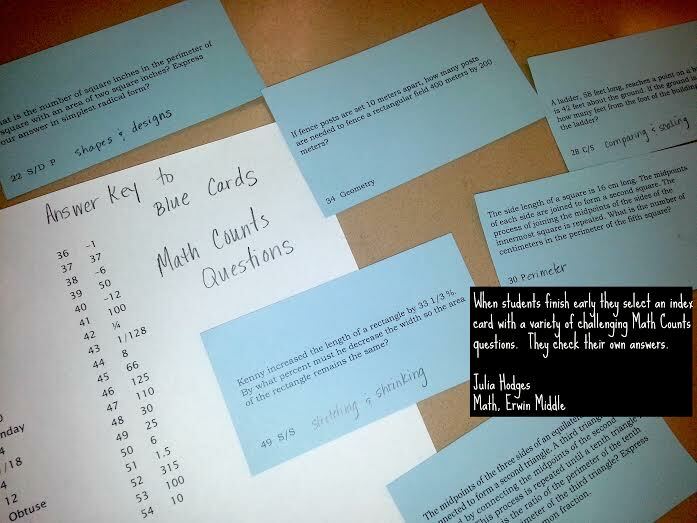 This is a great activity when students finish their math work early." "Students seen here are participating in a fishbowl discussion on whether or not we should ban plastic bags, as a part of our environmental unit. Five students sit in an inner circle to discuss with each other and the rest sit in an outer circle. The other group will remain in the outer seats taking notes on what has been discussed by the other students. Students in the outer circle join the discussion as they please, but every time someone comes in from the outer circle, one student needs to leave, making room for others to join. The teacher facilitates by asking open-ended questions but then leaves the students to discuss with each-other. Students get points for participation and preparedness. 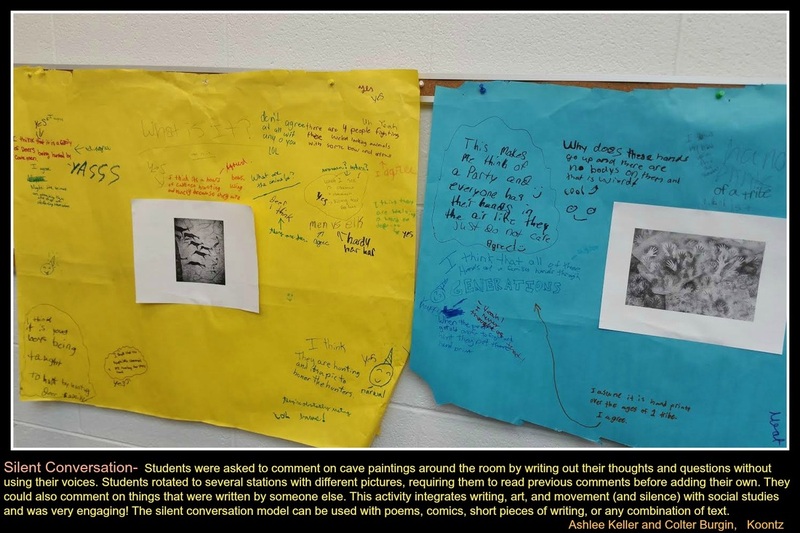 Students had all of their articles and notes and made cheat sheets for themselves and were encouraged to cite textual evidence to support their arguments. " Students are getting involved in their learning with active stations about the nervous system. 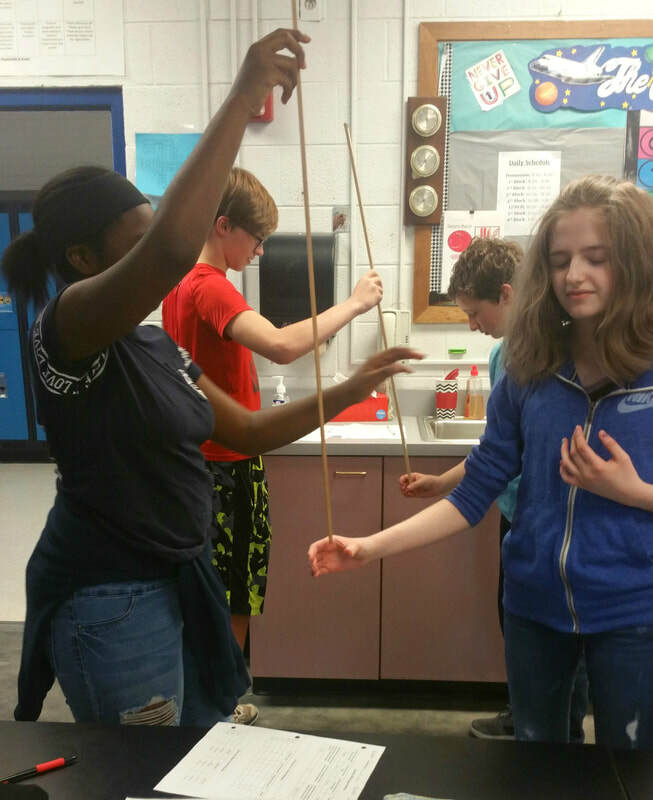 The students were testing their reaction time at the meter stick station. They had to use touch, sight, and hearing for when to catch the meter stick to see which they responded to best. After this, they analyzed why some people may be quicker with one sense than the others. 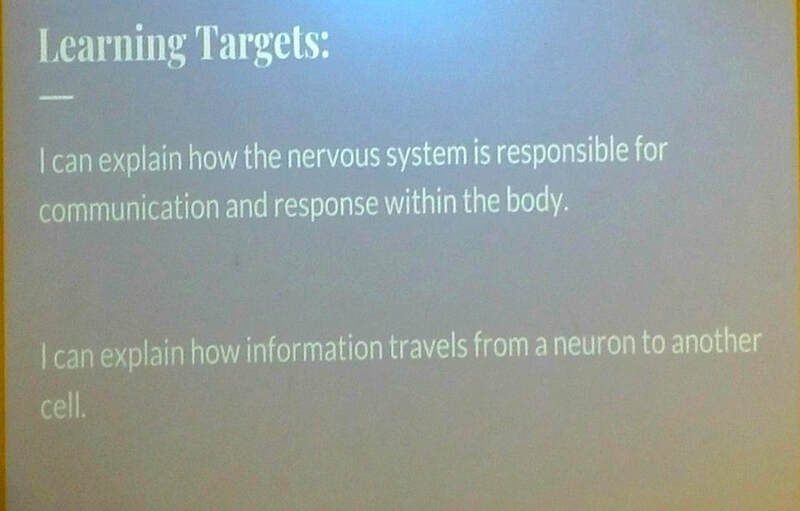 After students had completed all of the stations we discussed the traveling of the messages through neurons. "Pictured is an example of the weekly questions that are placed on the students weekly flashbacks (warm-ups). The flashbacks are created each week based on data collected and reviewed at our weekly PLC. The questions are based off of the unpacking documents and released test questions. Standards that are placed on the flashbacks are a review of standards already taught from the beginning of the year up to that point. 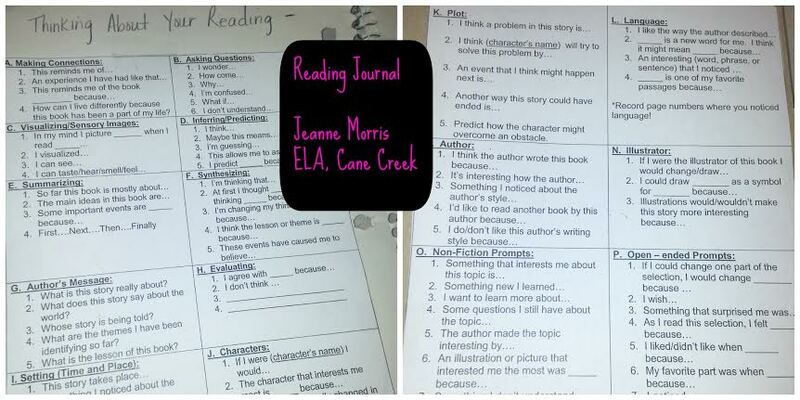 The goal is to get the students continually exposed to standards they need more support with and EOG question types. These weekly flashbacks keep all of the standards fresh in students' minds." Who Has Influenced American History? Students researched a person from history of their choosing. Once they identified who they would like to research, students read about their individual using multiple sources, and then wrote a one page summary- an introduction to the reader as to who this person was or still is, and then argue how that person has influenced American History. On top of their writing summary, students are required to find three quotes that they enjoy or find inspiring from their chosen individual. 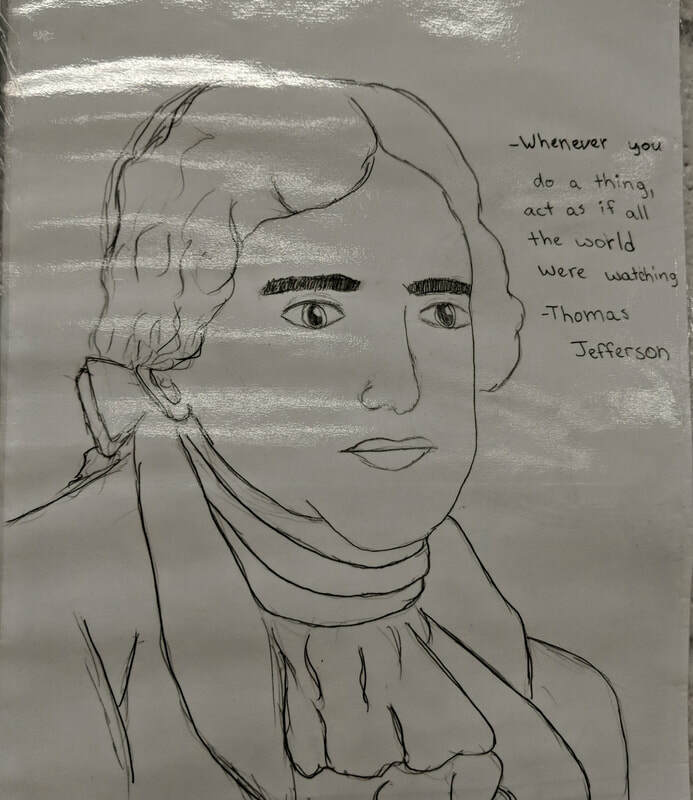 Finally, students create an image (or a visual representation) of the person they chose that includes one of the quotes they researched. This assignment allows me to see students' interests in history, while engaging students in a topic of their choice rather than me assigning figures from American History. March Madness- What's the THEME? I decided to play March Madness with my students to help them sort through their ideas in order to find the theme of our story. I came up with 16 possible themes, and as we read the students were looking for evidence to support the "theme teams". As the students found their textual evidence to support each theme, they put the quote on a sticky note and then placed it on the wall under the correct theme. We kept narrowing down the possible themes in our bracket. This is a great lesson and really engaged all students to find evidence to support their reasoning. This is our Horticulture 1 class at NBHS. 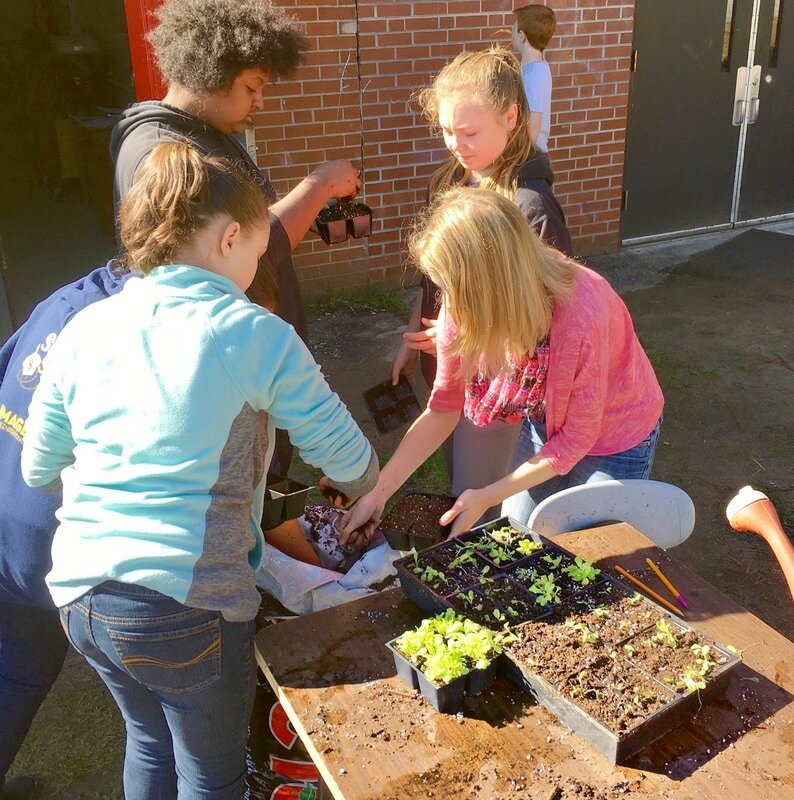 In late February I asked the students what part of our school they would like to adopt and beautify. They chose the NBHS entrance sign. Designing and planning this space was a class project. We researched different types of plants and identified when they bloomed. We also considered when we wanted our space to look its best. We took measurements and calculated how many materials we needed. We researched prices and made a budget. By the time we were ready to install the plants, our anticipation built and everyone was excited to pitch in. Weekly attention to watering, fertilization and weeding also helps students understand what plants need to grow their best. The students shown have been assigned to build a racing robotic car using VEX Robotic materials. 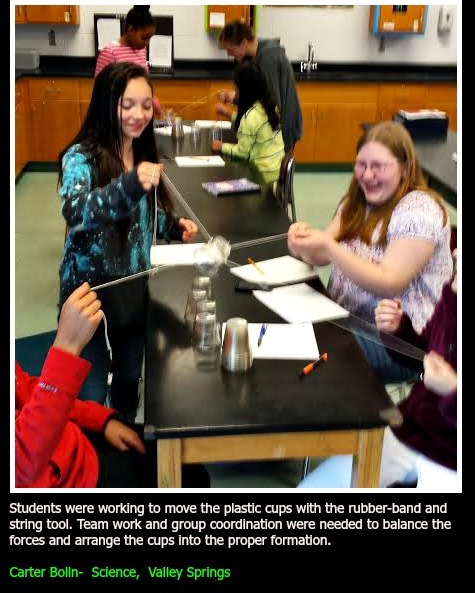 This activity allows the students to collaborate in groups on how to build the most efficient car with gear ratio, weight distribution, and aerodynamics all playing a key role. They've also learned how to code the programs telling the "brain" of the cars exactly how fast, far, and what direction to go. 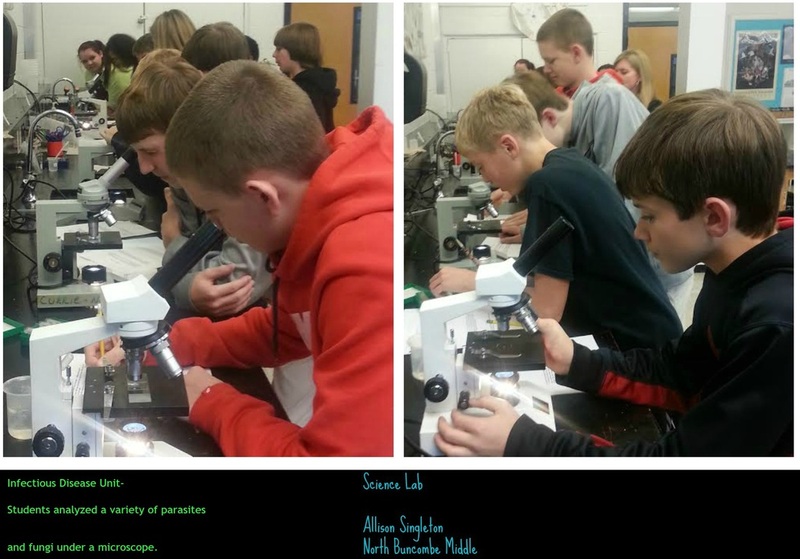 Each student has been exposed to possible careers in engineering through this activity. 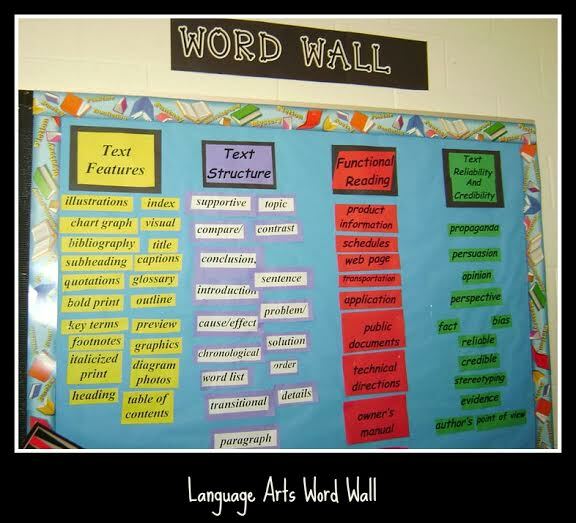 A word wall is an organized collection of vocabulary words and visual representations prominently displayed in a classroom. The words need to be organized by a label, category or purpose. 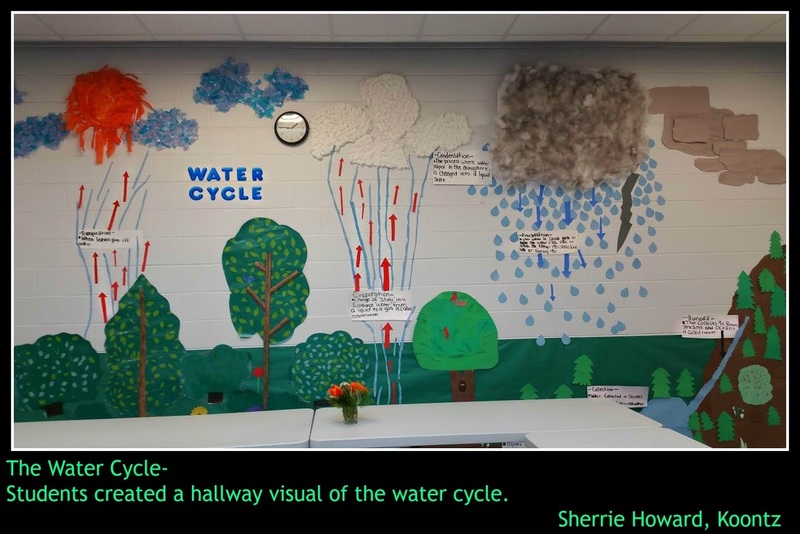 This display is used as an interactive tool for teaching. 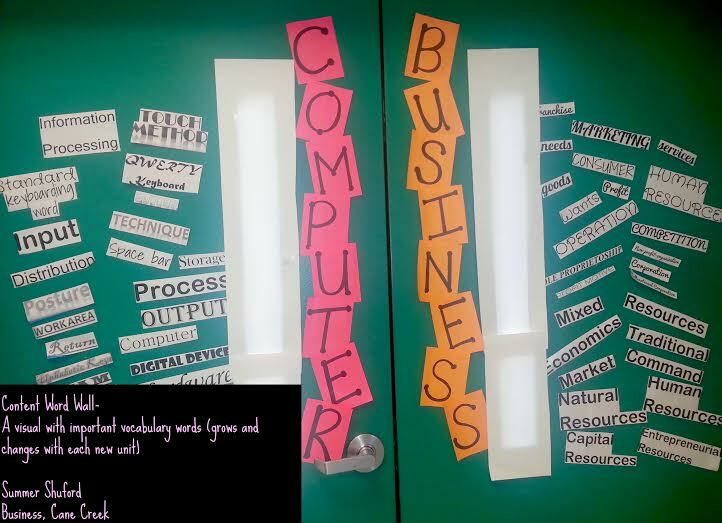 The word wall is "alive" and grows throughout the school year. 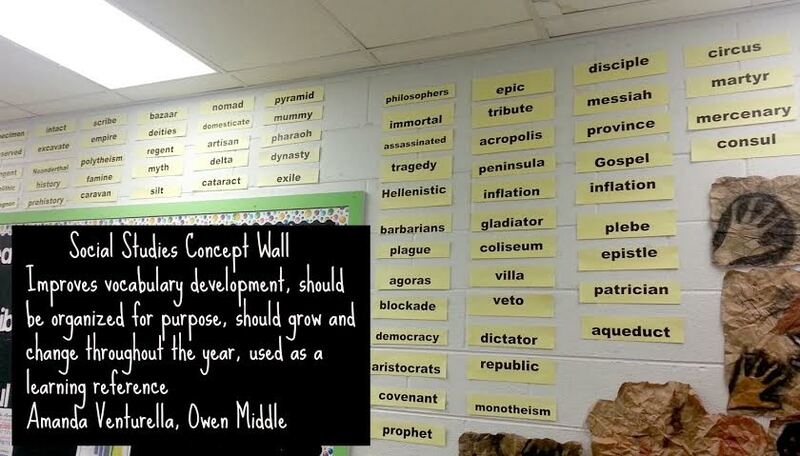 Teachers and students should consistently be referencing the word wall so the terms begin to stick. We use these math talk starters in our classroom during group and class discussions. Frist, I model all of these questions for my students, so they have a better understanding of the discussions I am listening for. As a teacher, they help me to ask deeper thinking questions that require students to really think through the math. For students, I tell them to use these as a prompt to begin discussions when they are working together in groups or pairs. Many times students sit there without knowing how to discuss math, so these starters are very heloful. If a group is off task or a group claims they are done, I refer them back to these questions. 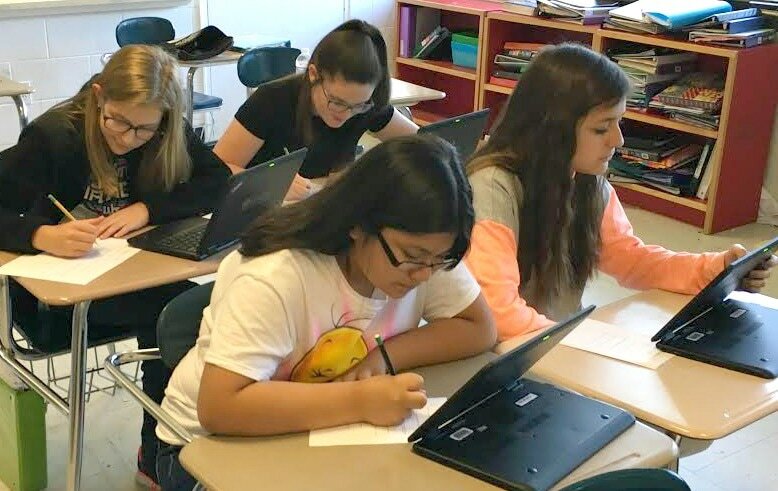 In this activity, the students are working in pairs comparing and contrasting the traits of the two main characters from "The White Circle," by John Bell Clayton. They are reviewing the story and finding examples of traits that are characterized indirectly, and then writing the traits on a double-bubble map. The purpose of the activity is to show the students that the two characters may seem different at first, but in fact they share quite a few similarities! ​In Agriculture class, we were studying a lesson called "Where's the Beef Come From?" Students learn the life cycle of beef cattle and how the cattle are cared for at each stage of their development. I am explaining the importance of identification tags and where exactly in the ear these tags are attached. ID tags allow beef cattle producers to give individualized care and be able to keep records of each animal's health. This allows the beef producer to run a more efficient operation. Students always enjoy working with the animals. In groups, students engage with their text using the "I Notice, I Wonder" reading strategy. The ‘Notice and Wonder’ strategy involves asking two simple questions: ‘What do you notice?’ and ‘What do you wonder?’. 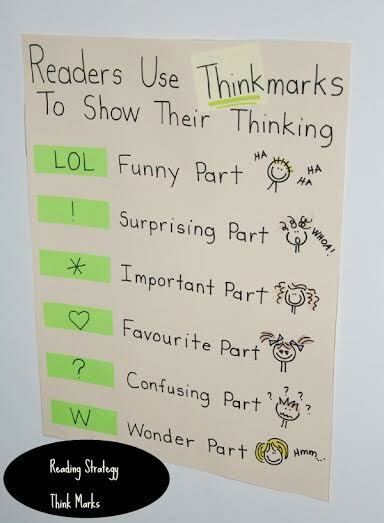 These are powerful prompts to engage students during reading. Students had cards they were asked to sort into groups of their choosing. They had to label the categories and explain to their partner why each graph went into each category. Once the graphs were all sorted, student switched tables to look at another group’s sorting. They had to try and figure out what the groups were and why the cards were sorted in the way that they were. 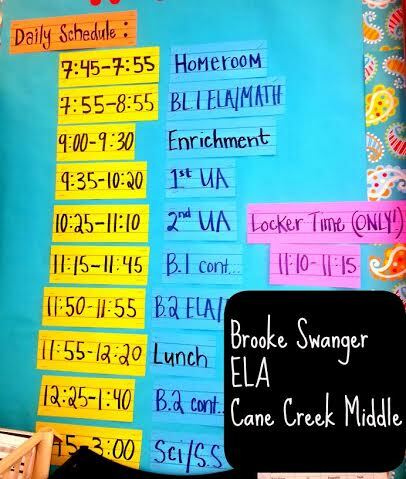 Bell Ringers are warm-up activities that students complete at the beginning of class- when the bell rings. They are the hook, pre-game or warm-up of your lesson. The content is aligned to what we are teaching that week. Students get a new one every Monday morning and are expected to be working on them by the time the bell rings to start class. Students have a plastic binder that they keep them organized in. 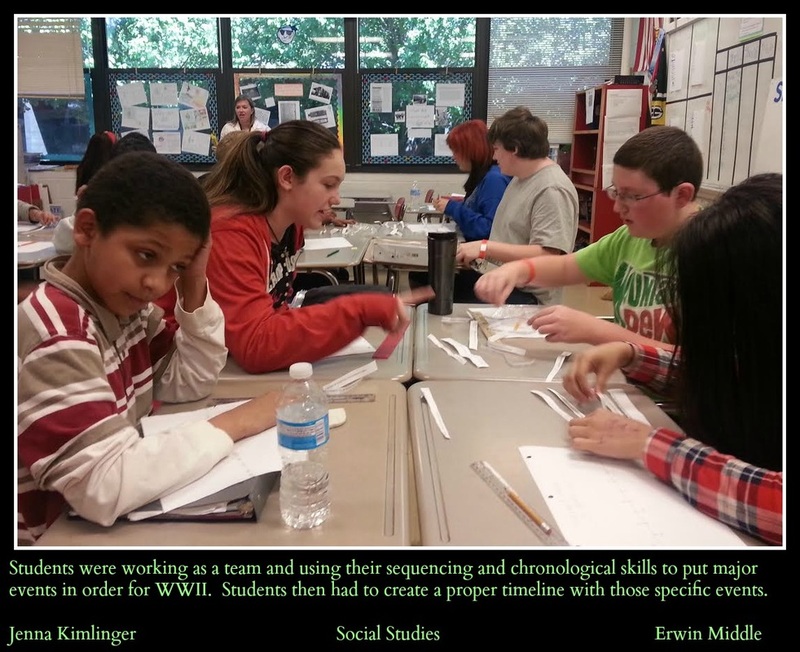 The activity gives students consistent opportunities to work with skills needed specifically in Social Studies but also carry over to all content areas. Friday is Free Write Friday : Students are given a free-write prompt and are expected to write at least 5 sentences. 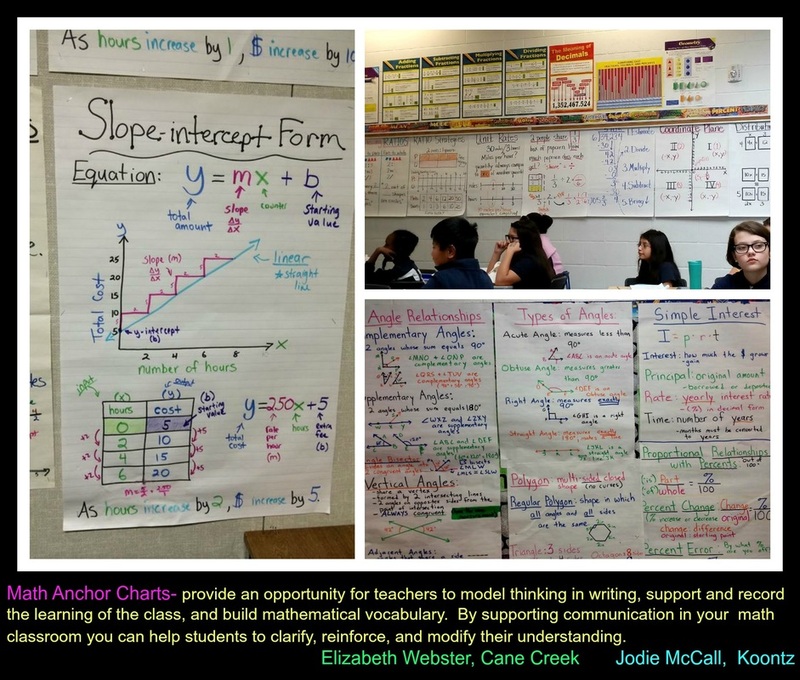 Math anchor charts provide an opportunity for teachers to model thinking in writing, support and record the learning of the class, and build mathematical vocabulary. 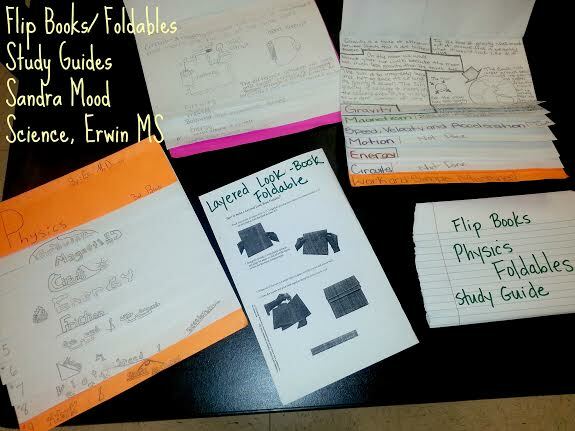 A Foldable is a 3-D, student-made, interactive graphic organizer based upon a skill. 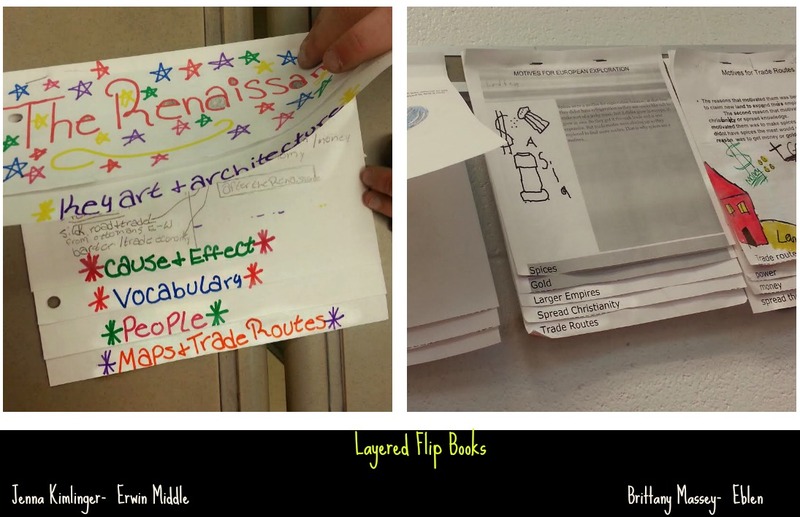 Making a Foldable gives students a fast, kinesthetic activity that helps them organize and retain information. 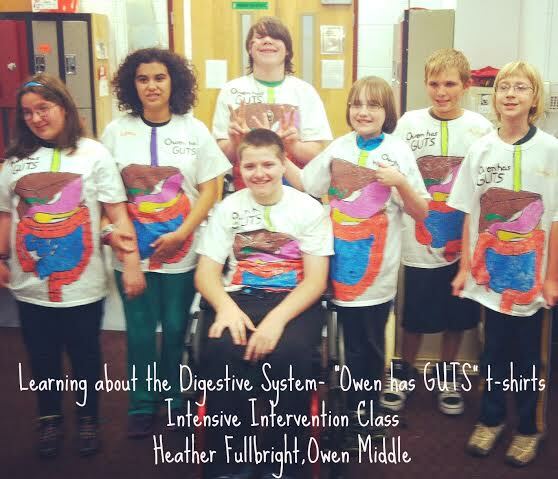 These student-created graphic organizers are a great way to engage students and create effective study aids. Foldables can be used for any subject and have many different uses. 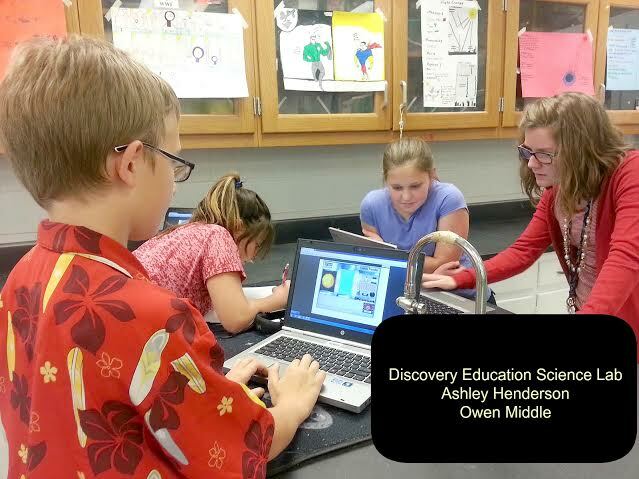 They give students an opportunity to create something that they can then refer back to. Foldables can be as simple or as complicated as you want them to be. 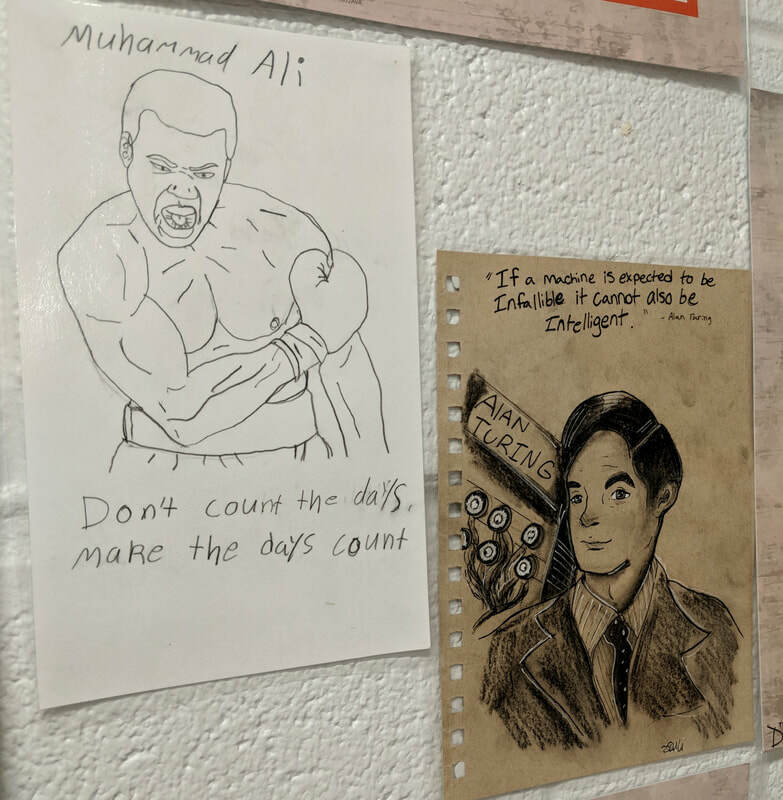 I have 3 different boxes in my classroom- one for questions and suggestions, one for compliments, and one for happy school memories. 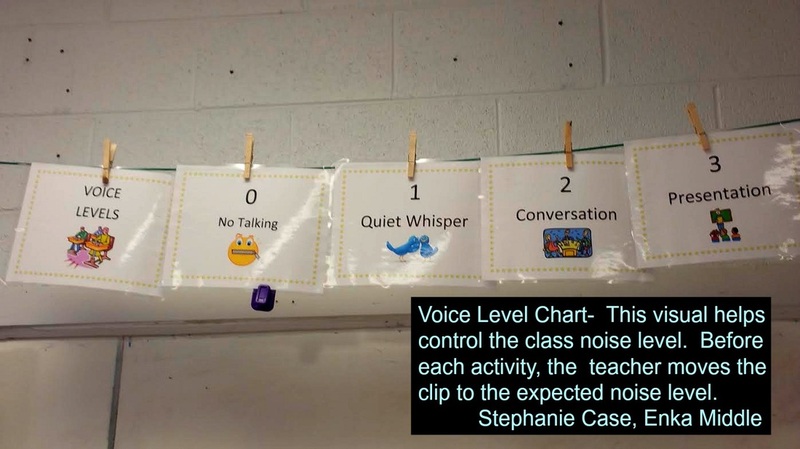 This is a quick and easy way to help build classroom morale and open communication between the teacher and students. We read the notes from the questions and suggestions box and the compliment box weekly, and we read the happy school memories notes at the end of every 9 weeks. I make my expectations for the types of notes clear, and almost all of the students participate in this activity in a positive and appropriate way. It is wonderful to see a student shine when they are hearing a compliment about them being read aloud to the class! 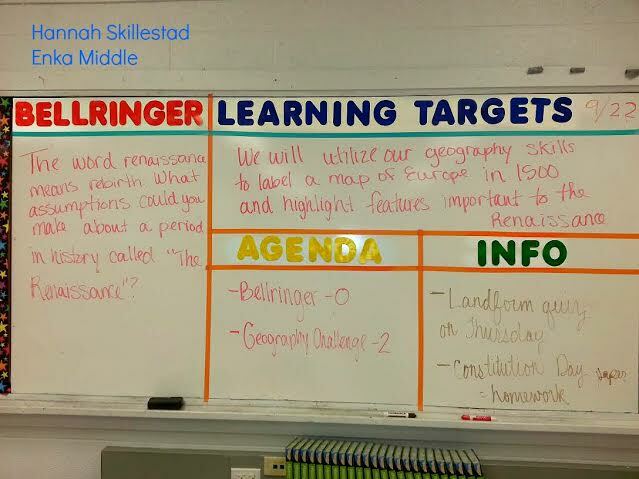 As a bellringer, students were asked to look over each problem in their weekly homework and connect it to one of our learning targets for that week. This got students thinking about what the question was asking, and what skill was needed to solve the problem. 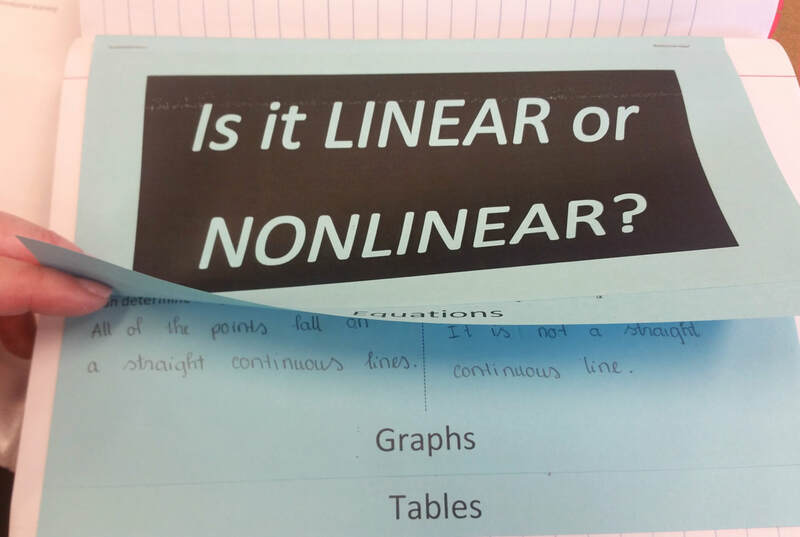 There were a few questions that did not connect directly to these two learning targets, in which case we asked the students to write their own targets for those questions. This made students think deeply about the problem and to understand why the problem was even being posed. 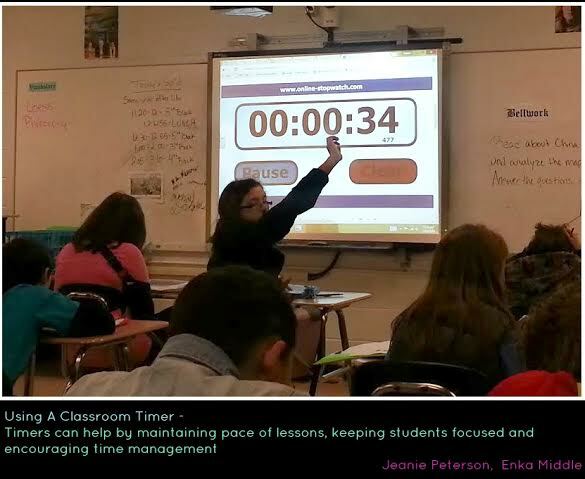 Bell Ringers are warm-up activities that students complete at the beginning of class- when the bell rings. They are the hook, pre-game or warm-up of your lesson. Students worked in pairs to play their own rhythms on the drum. 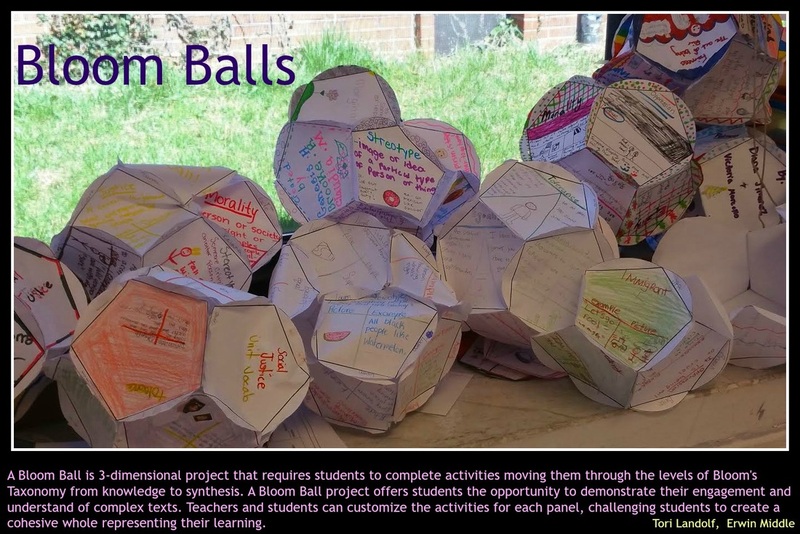 This is a great way for students to reinforce what they have learned, to work together, and to develop creativity. 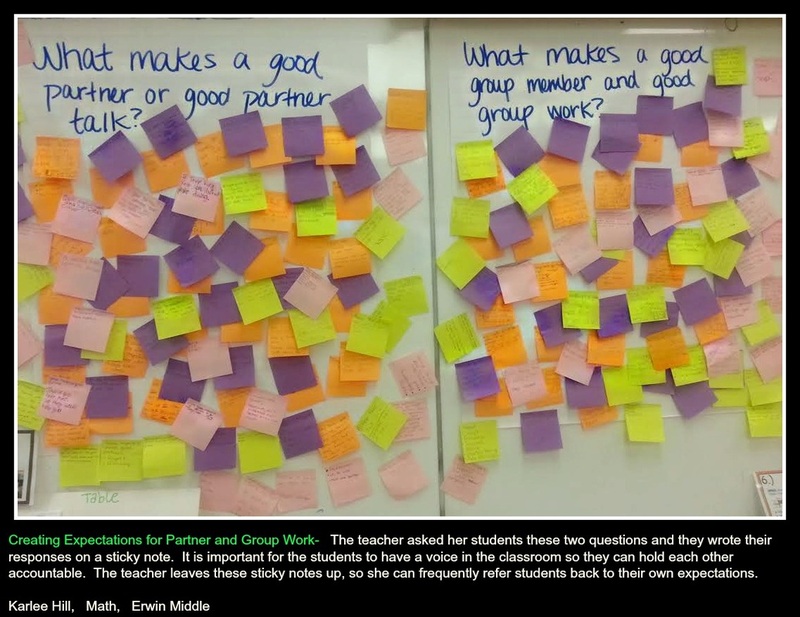 Think-pair-share can be used any time you want to plug interactivity into a lesson: Simply have students think about their response to a question, form a pair with another person, discuss their response, then share it with the larger group. It breaks content into bite-sized pieces. The brain can only process so much at one time and to learn material you must interact with it. It takes students out of the "sitting and getting" mode and provides them time to think, talk, and process. 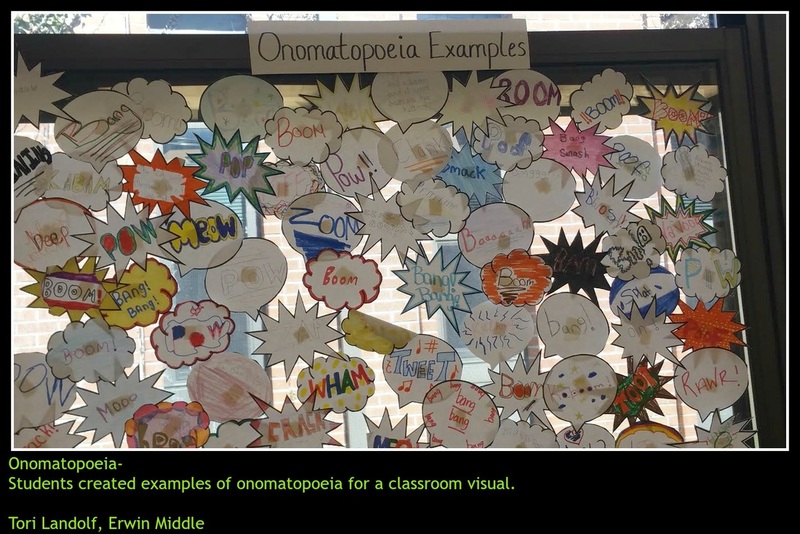 A Visual Word Wall is a tool that contains vocabulary terms with an illustration or photograph. 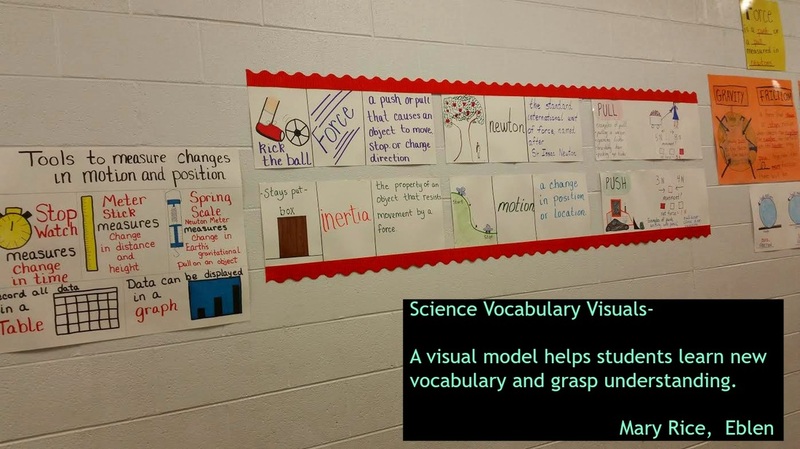 Student-friendly definitions with supporting visuals help students remember the important vocabulary words. 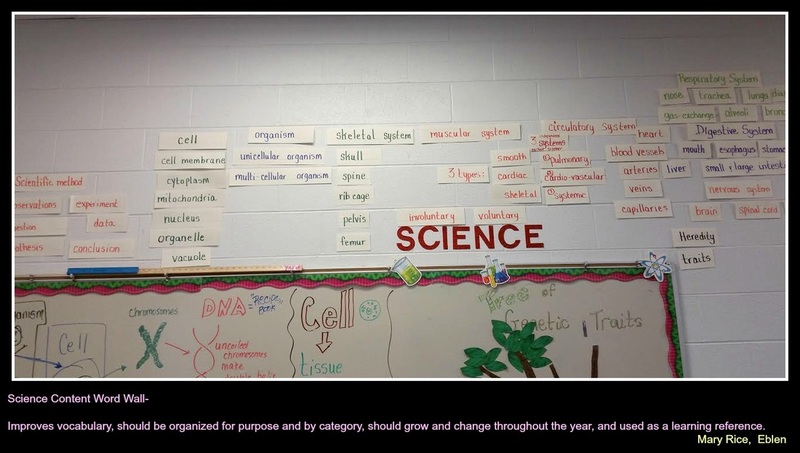 A word wall is an organized collection of vocabulary words and visual representations prominently displayed in a classroom. The words need to be organized by a label, category or purpose. 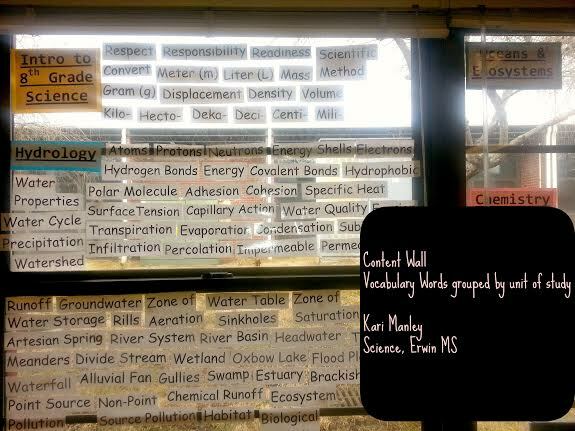 Words are to be posted as they are introduced in the day’s lesson.This display is used as an interactive tool for teaching. 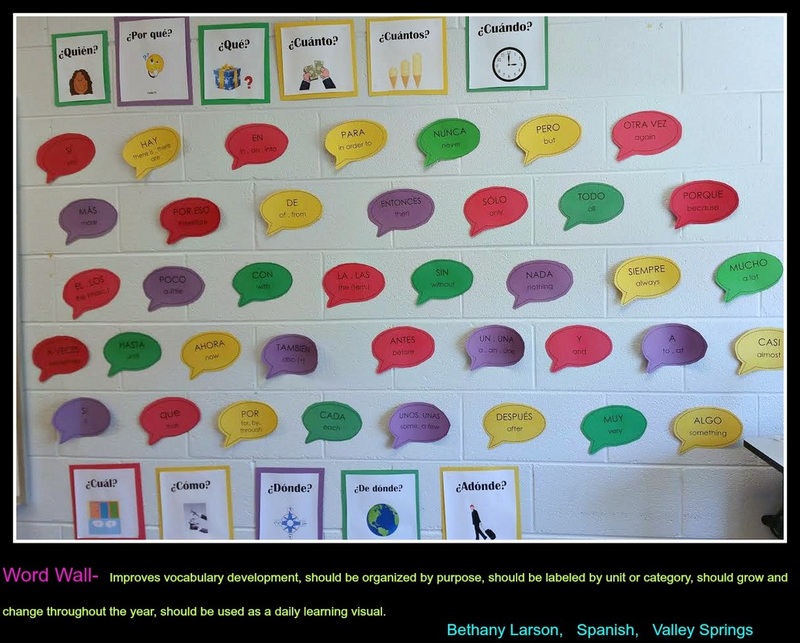 The word wall is "alive" and grows throughout the school year as you cover new units and vocabulary. Every time a new vocabulary word is introduced or mastered, the teacher or student should add the word to the word wall in the appropriate category. Teachers and students should work together to determine which words should go on the word wall. 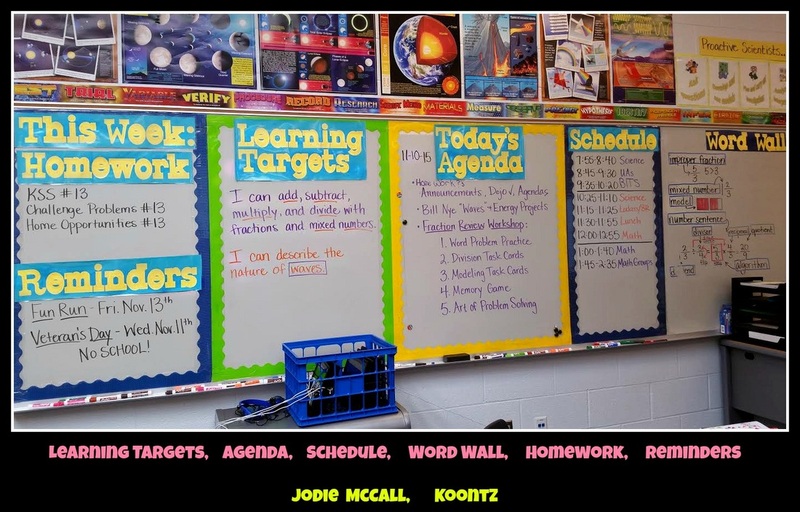 Teachers and students should consistently be referencing the word wall so the terms begin to stick in short and long term memory. Student teams often function most effectively when members have designated roles. These can be instructor-determined or established by the groups themselves. When we begin a new unit of study, our students are provided with a list of vocab words, the definition, an image and a sentence that uses the word. We either use Quizlet or Google Slides. Students are then instructed to fill out the Frayer Model with the vocabulary word, their definition of the word, and an image that helps them remember/understand the concept or word. Students keep this vocabulary in their interactive notebooks. 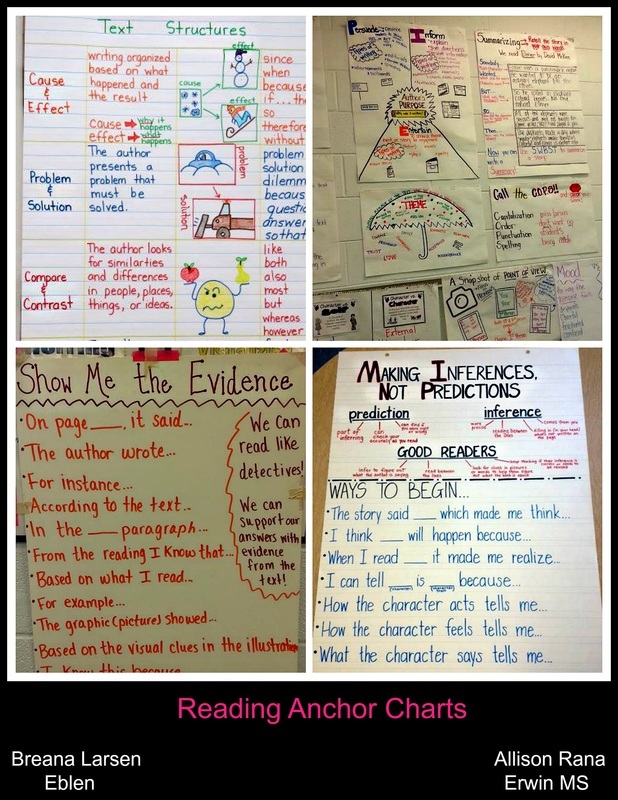 Anchor charts build a culture of literacy in the classroom, as teachers and students make thinking visible by recording content, strategies, processes, cues, and guidelines during the learning process. 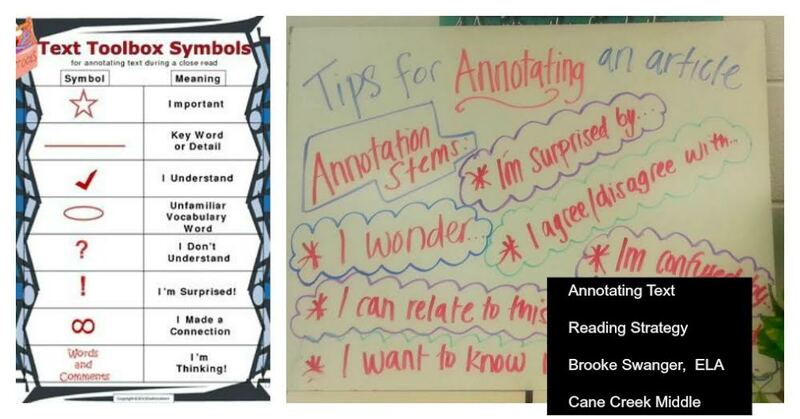 Posting anchor charts keeps relevant and current learning accessible to students to remind them of prior learning and to enable them to make connections as new learning happens. Students refer to the charts and use them as tools as they answer questions, expand ideas, or contribute to discussions and problem-solving in class. 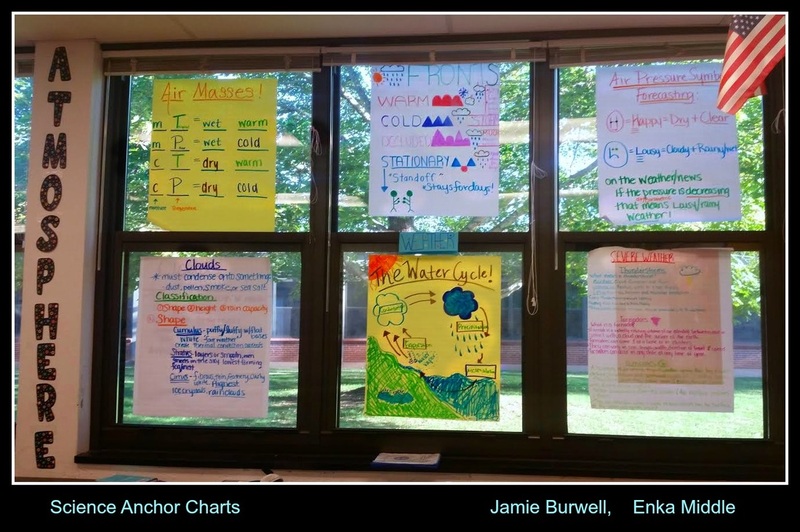 Building Anchor Charts --- Teachers model building anchor charts as they work with students to debrief strategies modeled in a mini-lesson. 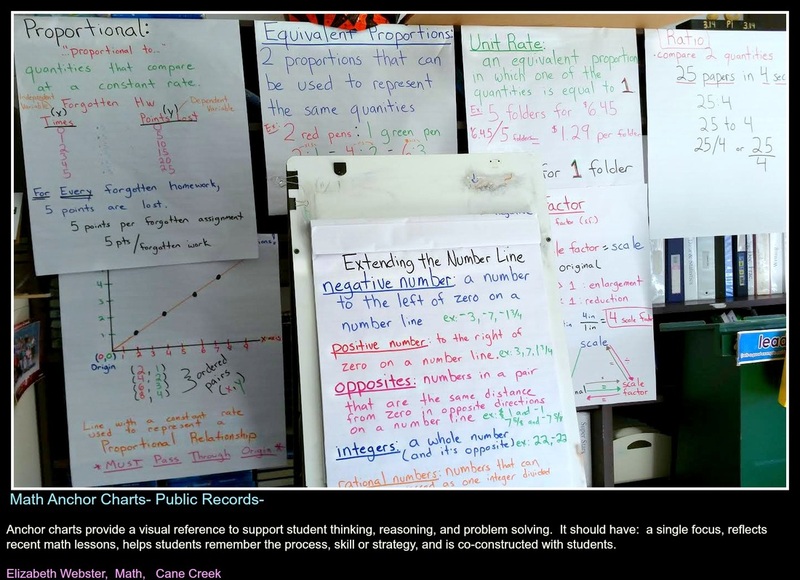 Students add ideas to an anchor chart as they apply new learning, discover interesting ideas, or develop useful strategies for problem-solving or skill application. 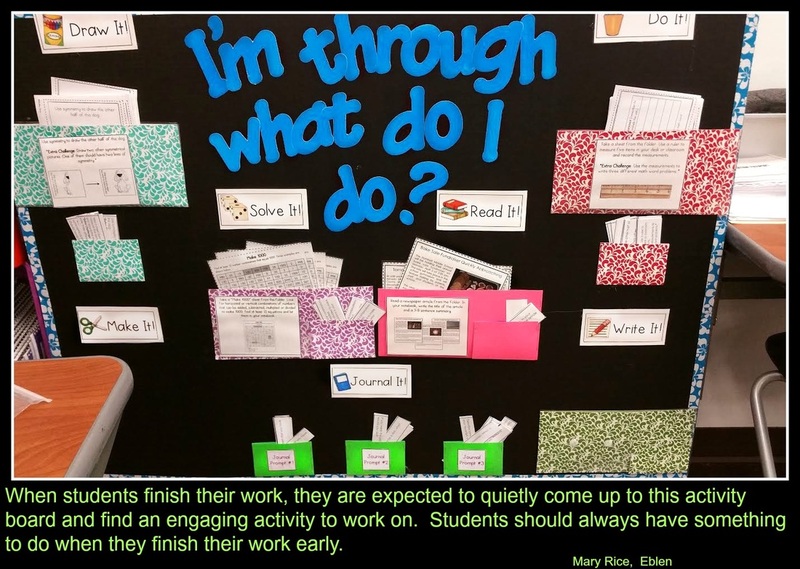 Teachers and students add to anchor charts as they debrief student work time, recording important facts, useful strategies, steps in a process, or quality criteria. 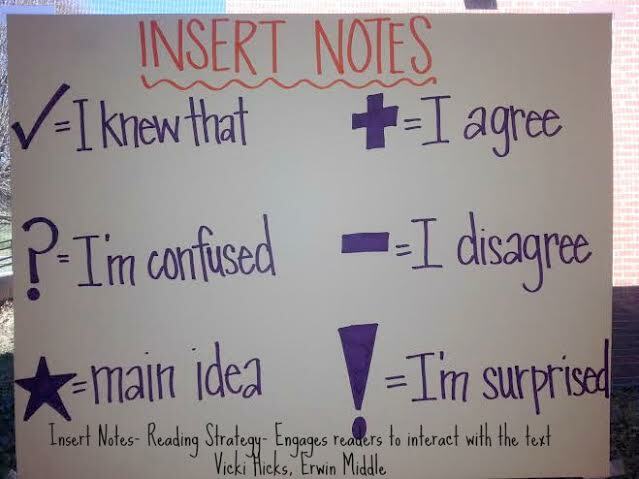 Students can create anchor charts during small group and independent work to share with the rest of the class. This is a lesson I have adapted from the NC Council on the Holocaust which was a PD opportunity last year at UNCA. In groups of three, students will each read a different account of someone surviving the Auschwitz death camp in Poland during the Holocaust. All three of these personal accounts are from the perspectives of young people around my students' age; these stories are very engaging because my students can relate to them on some level (in world history this is a rare opportunity). Once each group member has read and answered the corresponding questions, they will teach the other two people in their group of the victim's experience that they were assigned. This provides an excellent opportunity for group discussion of comparing and contrasting each individual account. They will finish this assignment with an exit ticket in which they will synthesize their learning. 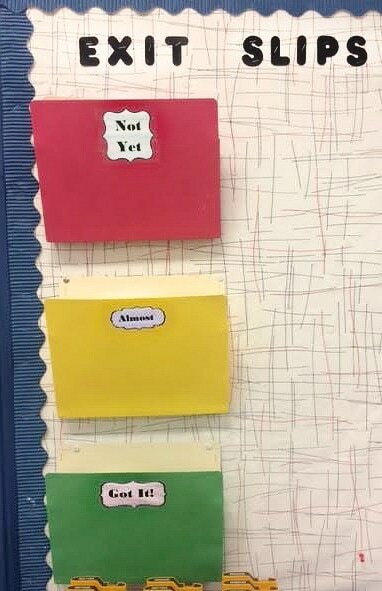 I have three folders which are green, yellow, and red on a bulletin board exiting my classroom. These are labeled "Got It!" (green), "Almost" (yellow), and "Not Yet" (red). This strategy allows me to not only assess the students on where they actually are on the math concepts, but it allows me to see where they assess themselves. I believe it is beneficial for them to assess themselves, and it gives me a sense of their confidence on the concepts. I can use this information to group them, reteach certain concepts, and provide small group instruction the following day. This is a picture of a fencing lesson that we did. Students worked in pairs to accomplish the task. The project was to drive a metal t-post then attach fencing wire to it. 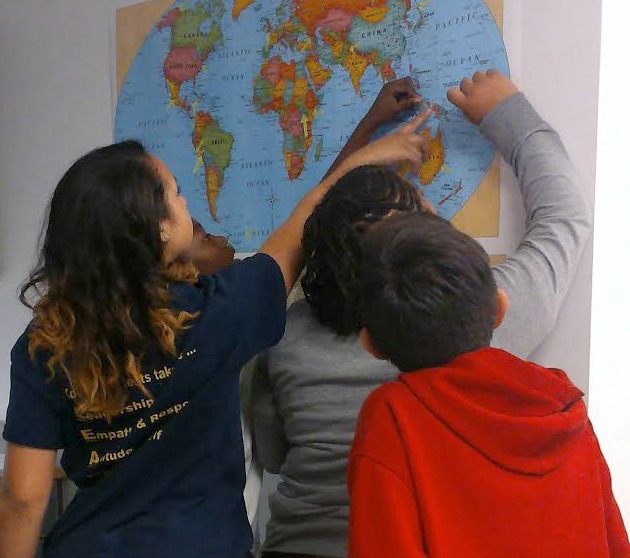 For Bellwork, Monday-Thursday, students add 3-5 countries (depending on how many countries there are) on a blank map of that week's continent. They have to memorize a certain number to get an A, like for Europe they had to know 7 for an A, 6 = B, 5 = C... and so on. The competition part of it is for the students who label the most countries in the class. First place gets a soda or a candy bar of their choosing. Second and third place get a small piece of candy from my stash. Competitive students labeled 35-40 countries! When it's all finished, the winners do a smartboard geography game to see if they can beat the timer. It's a lot of fun! Jeopardy is a great way to review anything and make it fun. 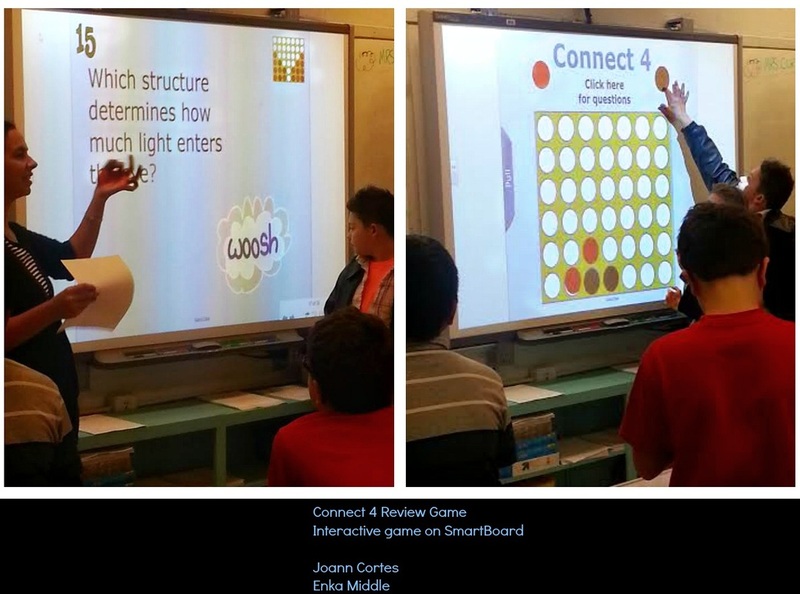 The students love to compete against each other, and it is super engaging! We introduced a new annotation strategy, "CAT-P," on this day-- Connections, Ask Questions, Tell Your Own Words, and Predict. To apply this new strategy, we annotated an article about cats. Students then participated in a Socratic Smackdown, a form of Socratic Seminar that focuses on debate strategies and rewards teams for technique and style as opposed to "being right." We had a student score keeper because teams were rewarded points if students used strategies such as citing textual evidence, making connections to other sources, and asking further questions. Deductions were made for interruptions, insults, or "rambling." Students were given a plane with four different types of materials and two matchbox cars. They placed the matchbox cars at the top of the ramp and let them go. They used the matchbox cars to measure and record the friction caused by different surfaces. 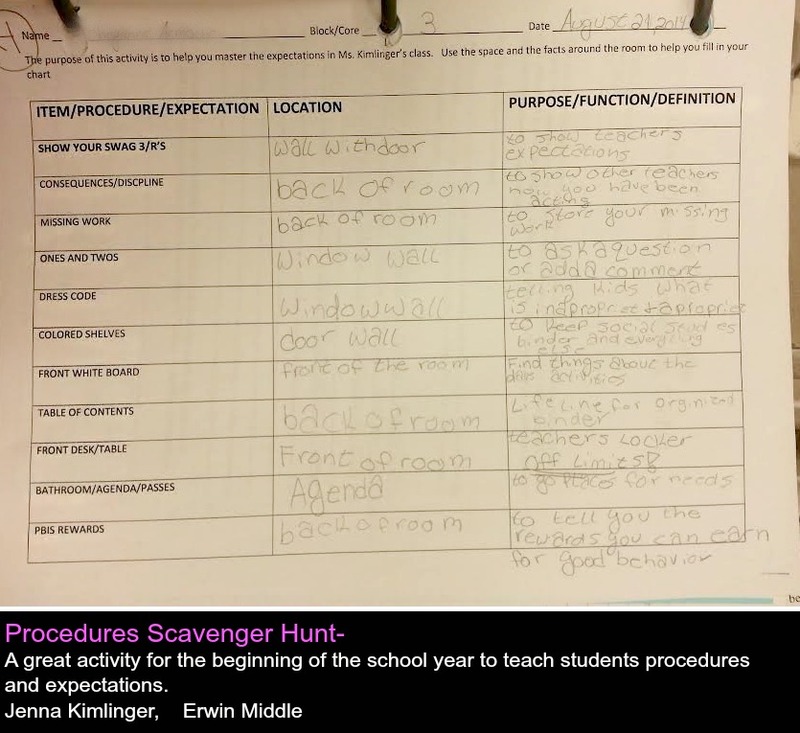 For this activity, students have to find answers to the questions on their paper by finding them in paragraphs that are posted around the room. It helps students learn to find evidence from the text to support their answers. It's a great way to get students reading, writing, and moving! In the picture, students are in the beginning stage of a fishbowl seminar. The Fishbowl is a strategy that helps students become contributors and listeners in a discussion. The students prepare their original thoughts and notes to guide them through the conversation. The students will then separate into two groups. One group will move towards the center seats where they will initiate the conversation discussing a recently completed reading, "To Build a Fire". 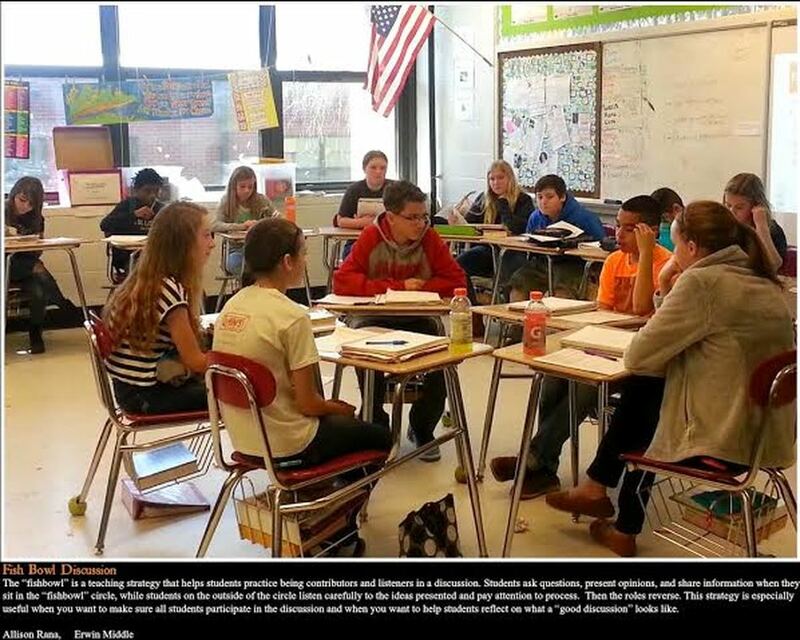 While students are in the "fishbowl" they will ask questions, cite evidence, share opinions, debate topics, etc. The other group will remain in the outer seats taking notes on what has been discussed by the other students. Then the students will exchange places and tasks. This process will continue until the allotted time expires. After the teacher completes the initial set up, the teacher's role is that of a conversation facilitator. The teacher will provide questions/comments to prompt conversation or to steer the conversation in a more appropriate direction. My students are studying Pakistan this year. They have done research to inquire about the customs, foods, language, and landmarks found in Pakistan. In addition, my students have Pen Pals from Pakistan, which they are connected to by Edmodo. 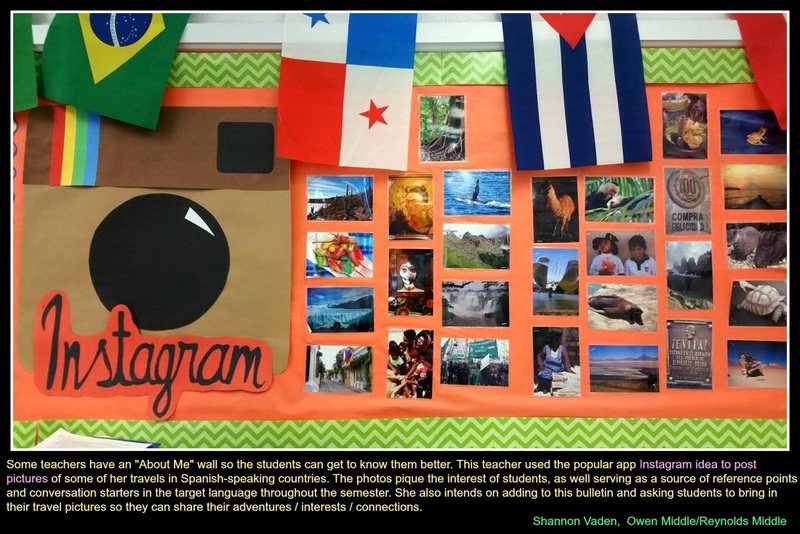 Students message back and forth, and can attach photos and videos to enrich understanding of their learning. 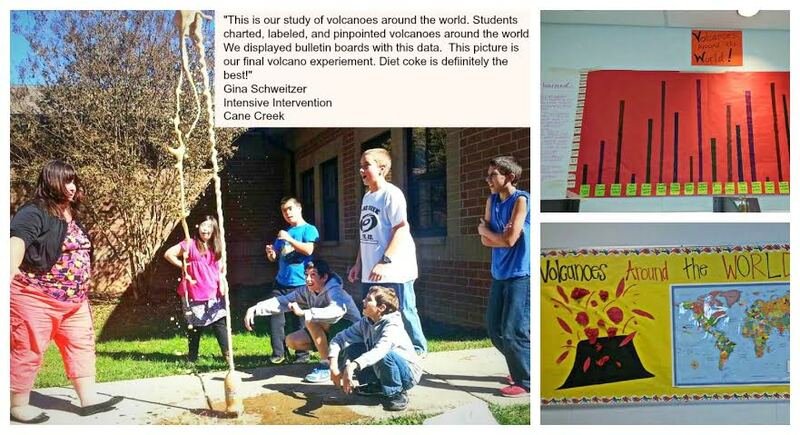 At the end of the hydrosphere unit students were to apply what they learned to a group project. They chose any three resources that are obtained from the ocean and built and oceanic city with the corresponding infrastructure for each resource. 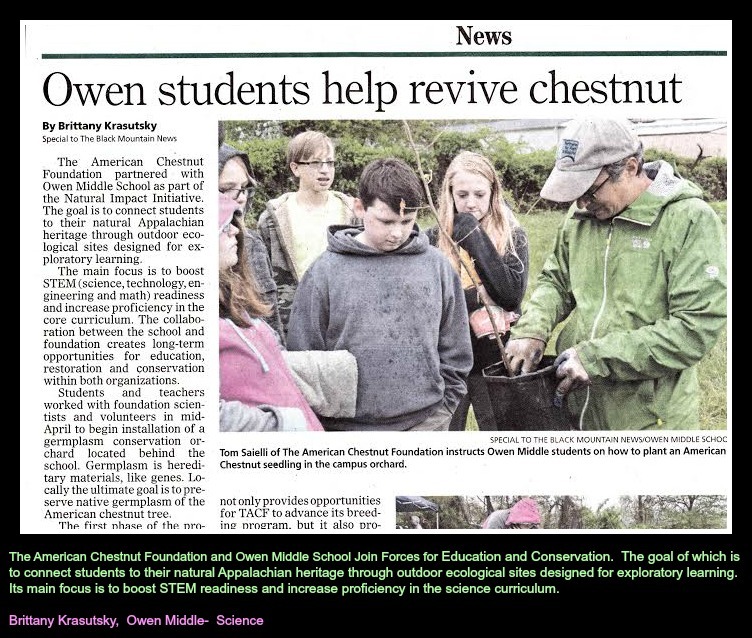 Students explored the various resources we gained from the ocean and balanced ideals of conservation and protection with the need for a strong economy in their city. They designed a brochure and built their oceanic city, which also had to be presented to the class. While reading To Kill A Mockingbird, students had the opportunity to read out loud with a partner. Students were assigned a number and told to find the partner with the same number. They were then instructed to take turns reading one page at a time switching back and forth between partners with a timer set for 2-3 minutes. When the timer went off, they switched to a different assigned partner. This activity allowed students to practice their reading and listening skills while working with a complex text. Students enjoyed reading the text out loud and having the chance to move around the room to work with different classmates. 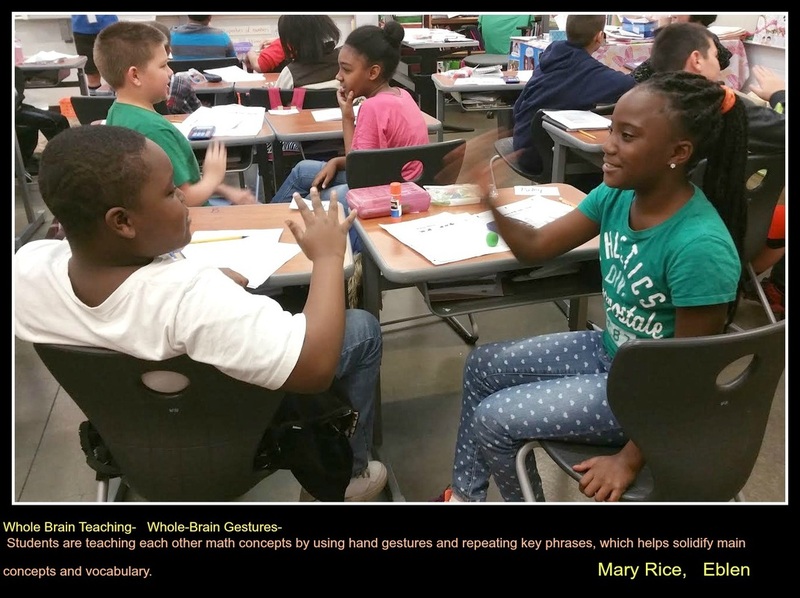 Paired reading is a research-based fluency strategy used with readers who lack fluency. It can also be used to increase comprehension. When using partners, more fluent readers can be paired with less fluent readers, or children who read at the same level can be paired to reread a story they have already read. Paired reading can be used with any book, taking turns reading by sentence, paragraph, page or chapter. 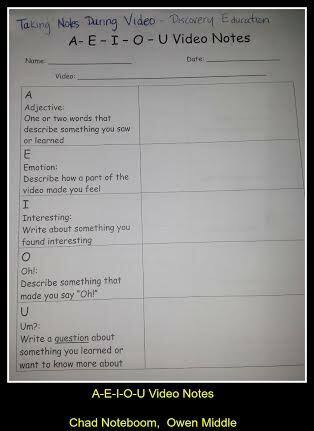 This strategy can be used as an activating or summarizing strategy. 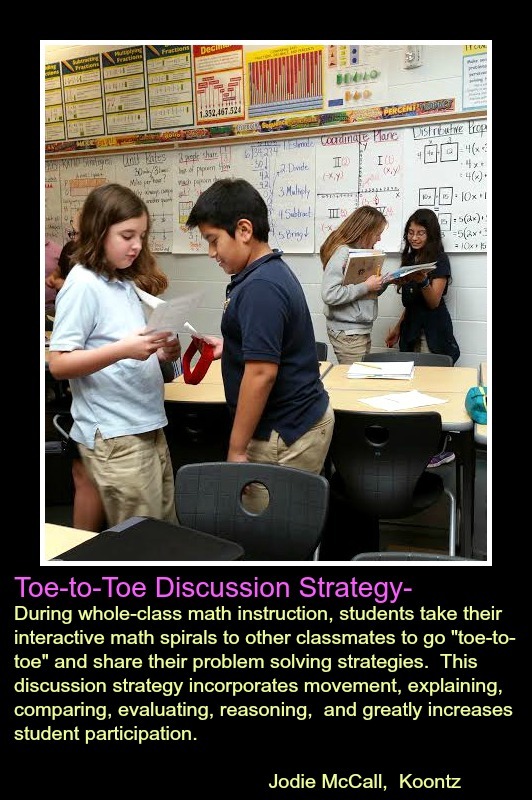 In this movement activity, students are given a topic of study, and asked to move around the room for the purpose of conversing with other students. During these conversations, students will share what they know about the topic, and will discover what others have learned. 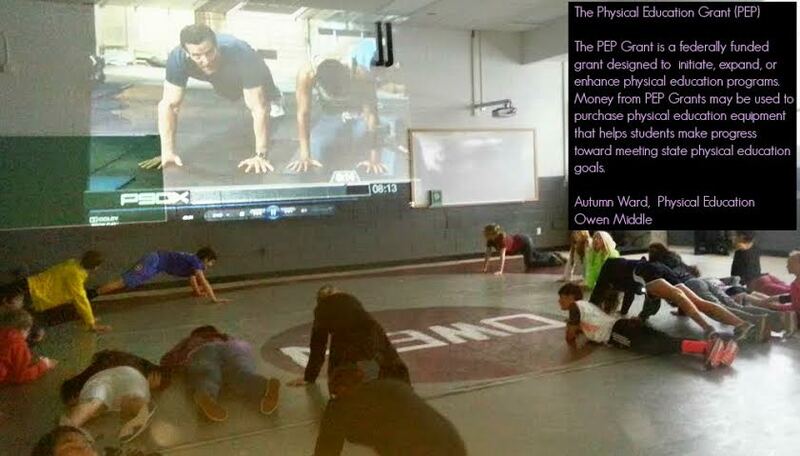 This is a great strategy to activate students' knowledge through movement and conversation. 4. When students are completing the survey form, the soliciting student should write the name of the informer on his/her worksheet. When the time is up, he/she will move on to the next classmate. 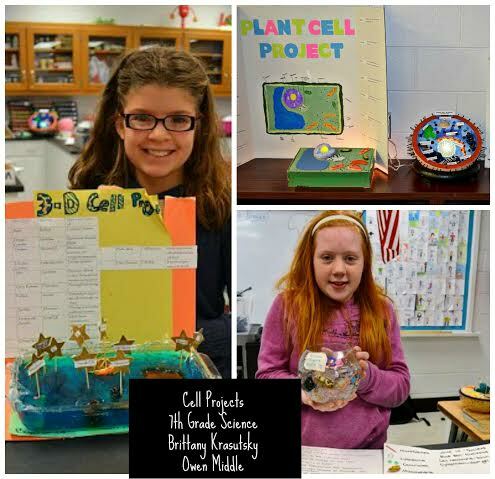 Enka Middle School partook in a Science Fair this year. 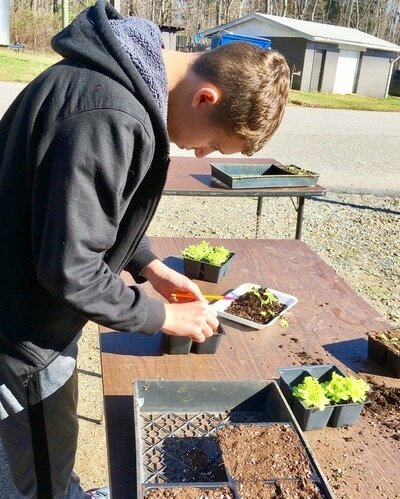 Throughout the fall semester, groups of students worked to conduct a scientific experiment. 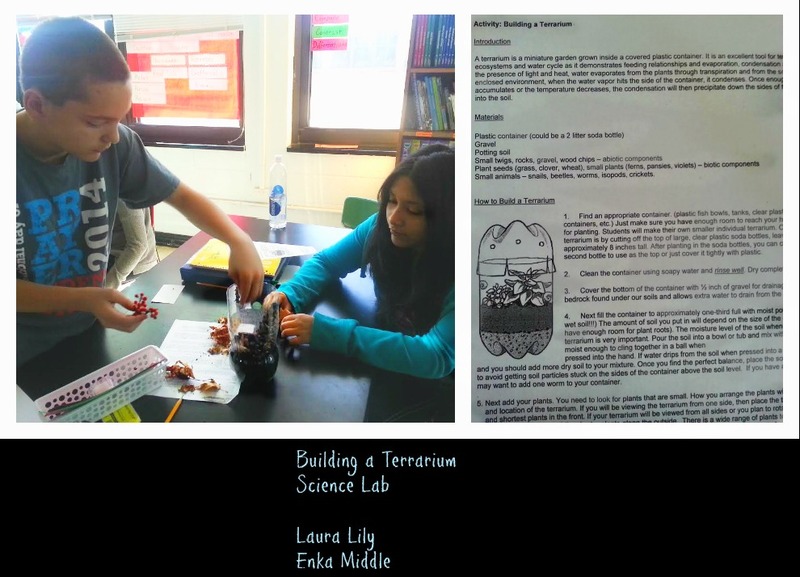 They designed their own experiment, collected data, and researched their topic. The final presentations were displayed in the library to be judged by an outside panel of judges. The top 20 projects traveled to Western Carolina University to compete in the Regional Science Fair. One project, left, placed FIRST in Junior Physics and moved on to compete in the State Science Fair in Raleigh. 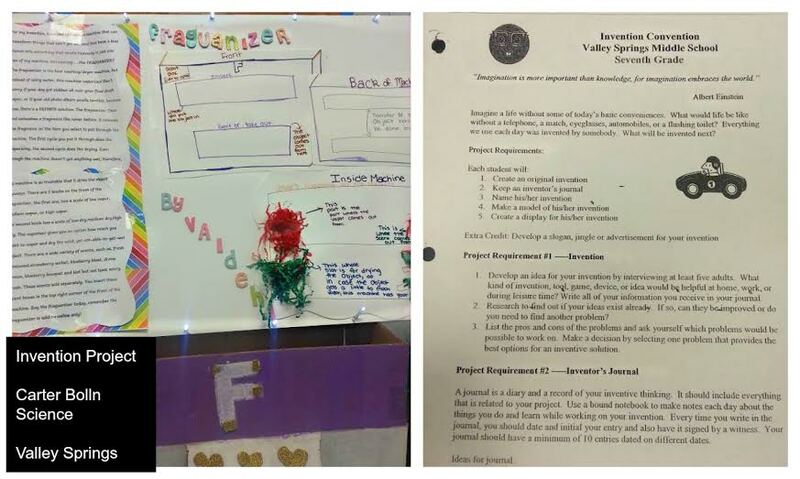 The Science Fair was an awesome learning expereince for all of our students! Pear Deck is an interactive presentation tool that can be teacher or student paced. It allows you to hear from every student every time. 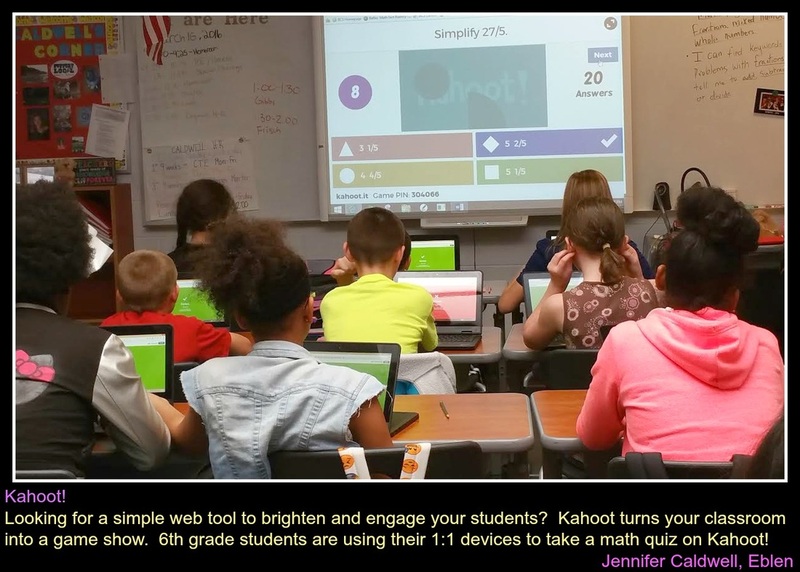 Every learner grapples with the interactive activity on his or her own screen, and knows their response will be anonymous to the rest of the class. This makes it less scary for students to participate and makes it clear that we expect every single person in the room to be thinking and engaged. 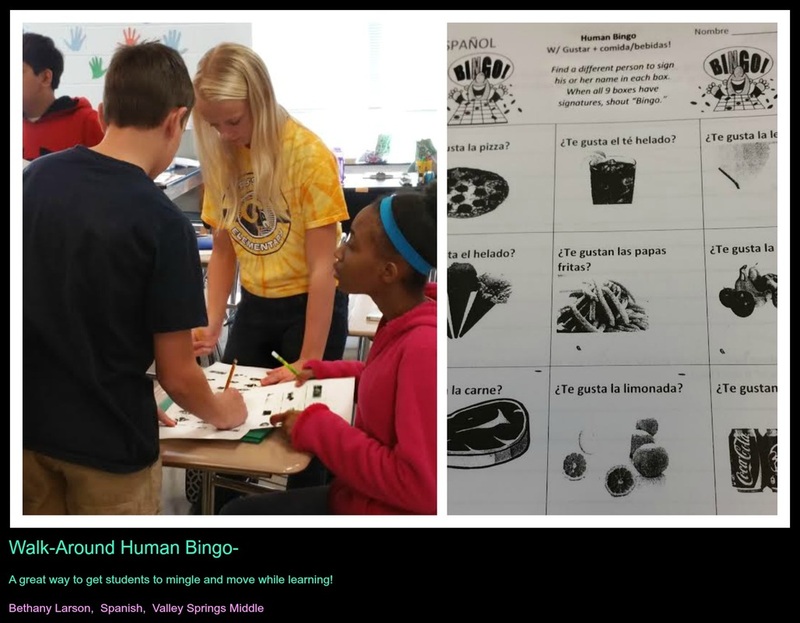 Pear Deck brings the classroom “clicker” into the 21st century with not only multiple choice-style questions, but text responses, numbers, drawings, draggable pins on images, and more. You can import old or create new presentations that students can interact with in multiple ways. This activity was introducing "Child labor during the Industrial Revolution". The learning target was, "I can describe working conditions for children during the Industrial Revolution." 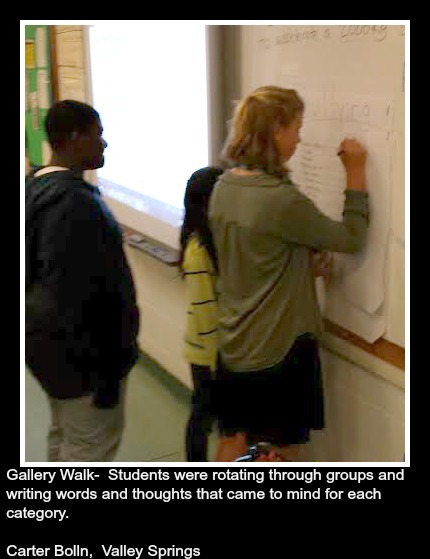 In this activity students were able to circle safety violations in a primary source picture, watch and repond to a short video showing children working in a factory, and even guess the age of a factory girl from Lincolnton, NC. 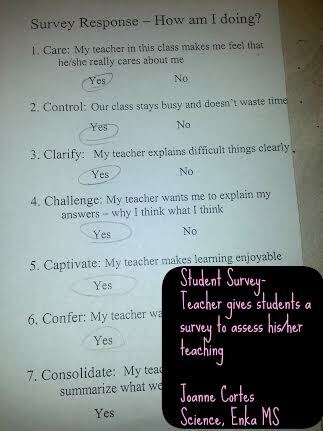 Student responses can be shared with the class and stored for formative assessments. Students were participating in a giant board game. This game space had students match giant vocabulary words with their definitions. Students had to record three definitions before moving on or receiving points for this game space. 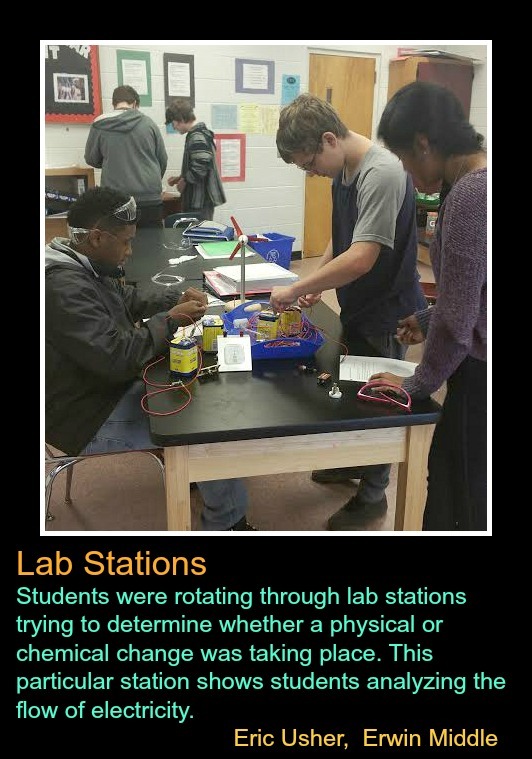 After students completed this station, they rotated to another station to complete another hands-on task. 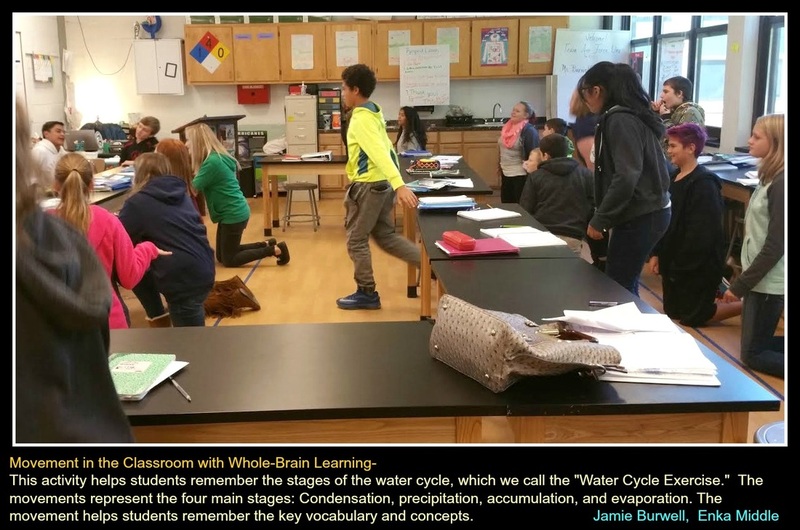 Each station had activities where students could practice and extend their learning. 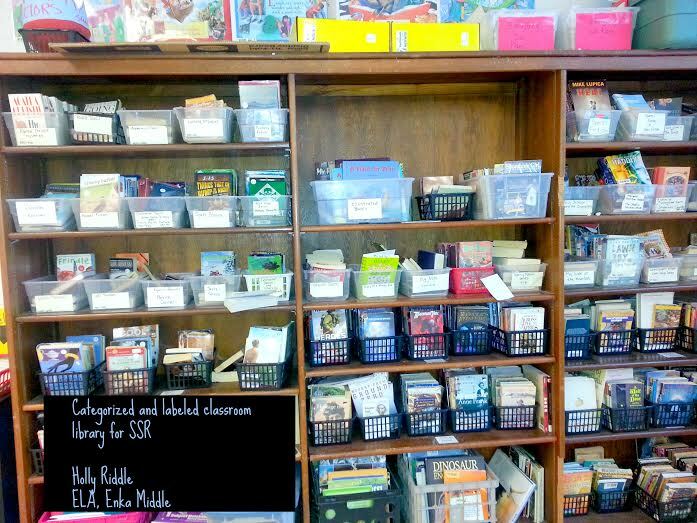 A word wall is an organized collection of vocabulary words and visual representations prominently displayed in a classroom. The words need to be organized by a label, category or purpose. 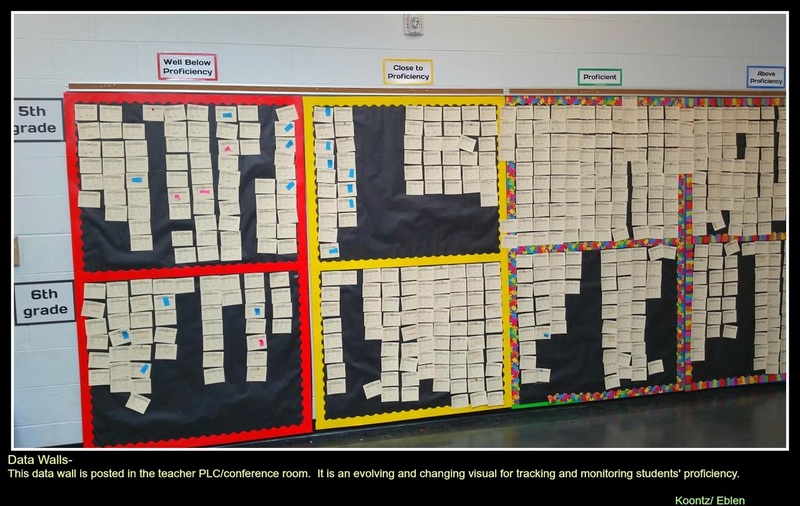 Mathematics Word Walls are to be active and built upon. Words are to be posted as they are introduced in the day’s lesson.This display is used as an interactive tool for teaching. 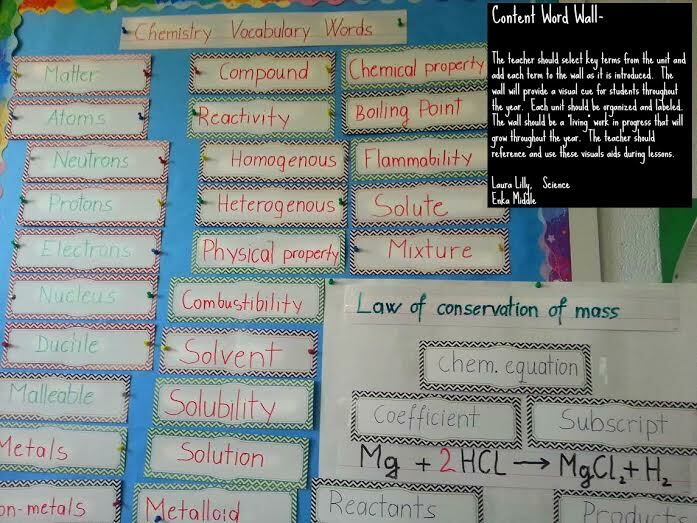 The word wall is "alive" and grows throughout the school year as you cover new units and vocabulary. 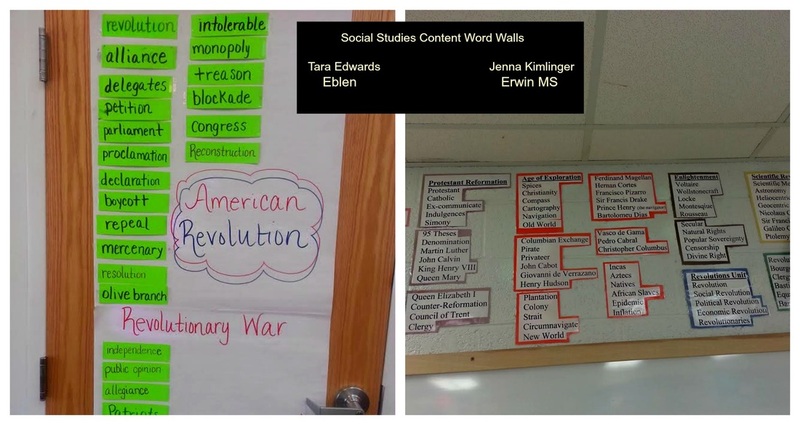 Every time a new vocabulary word is introduced or mastered, the teacher or student should add the word to the word wall in the appropriate category. 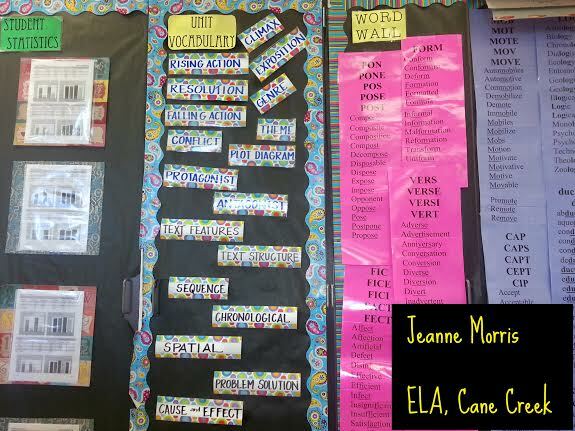 Teachers and students should work together to determine which words should go on the word wall. Mathematical language is crucial to children's development of thinking. If students do not have the vocabulary to talk about math concepts and skills, they cannot make progress in understanding these areas of mathematical knowledge. 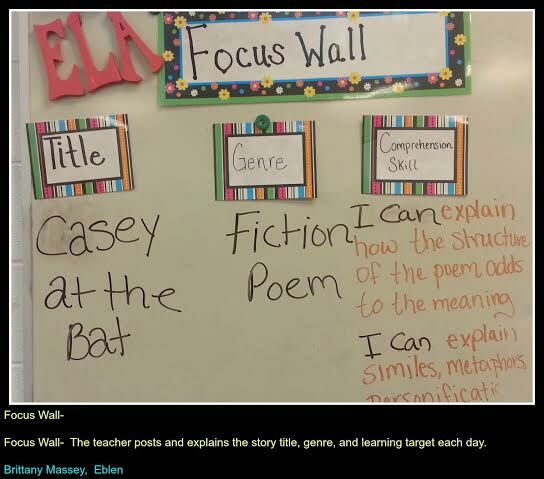 Teachers and students should consistently be referencing the word wall so the terms begin to stick in short and long term memory. Students are working to construct a roller coaster in a which they have to make a ball land in a cup without tipping it over. 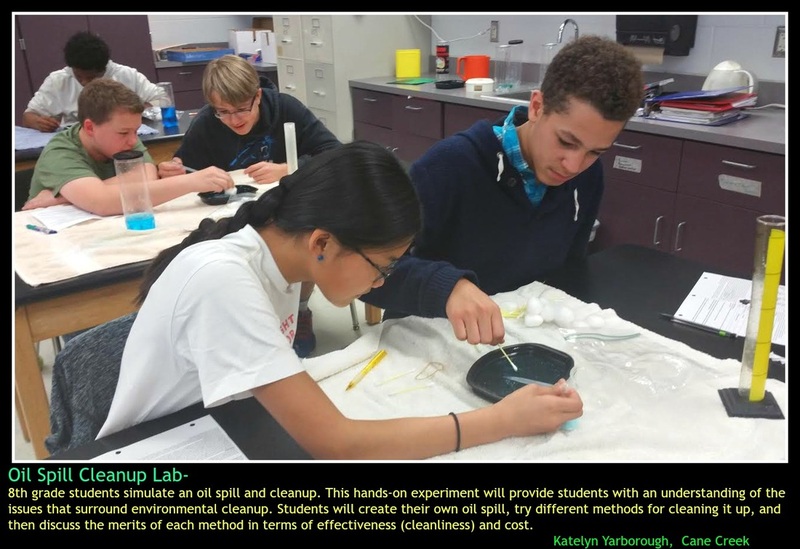 Students then use the lab to describe energy transformations. 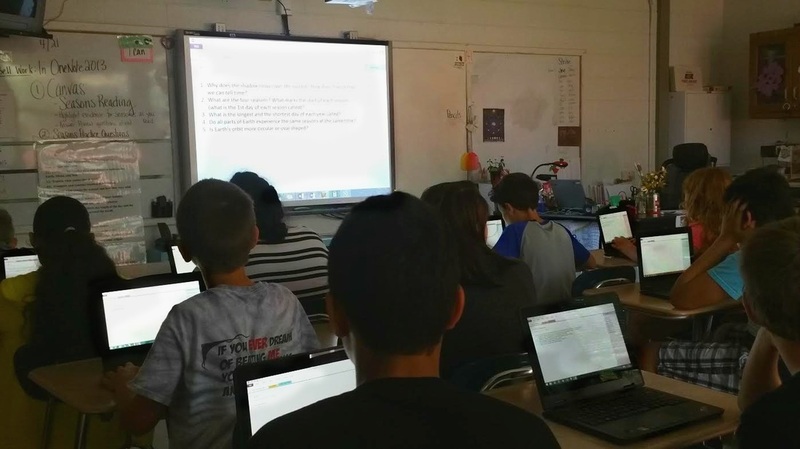 I have recently discovered the website https://quizizz.com/ and have been using it in my classroom to engage students. At the end of the game I am able to check the progress of my students and see areas they are excelling in as well as struggling in. 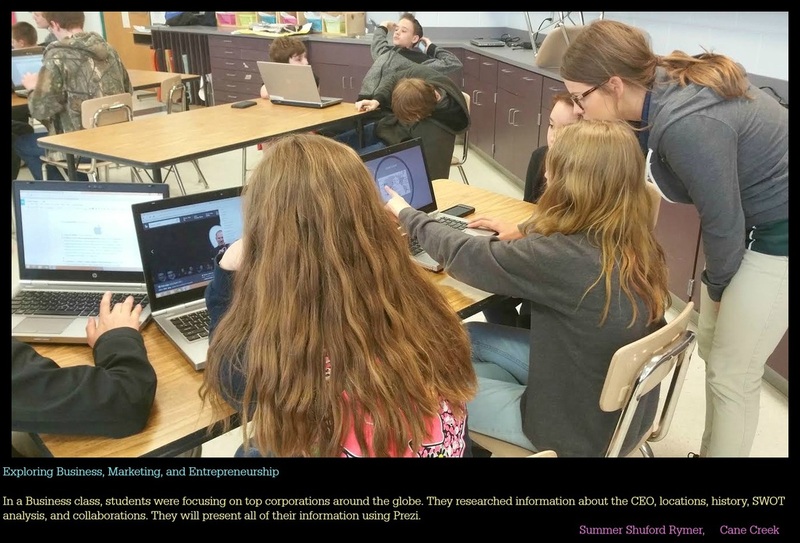 I also use this website as an exit ticket to gain insight into their understanding of the material covered that day. I have also used this to have students create questions in a google form to design quizizzs for them to use in class. Students love knowing that I am using their questions. Find amazing quizzes made by other teachers, or create your own quizzes and share them. Students play together, but each at their own pace. Quizizz is a fun multiplayer classroom activity, that allows all your students to practice together. Use detailed class and student-level reports to understand where your students need help. In our ELA curriculum, students study commonly used word parts (suffixes, prefixes, affixes, and roots) in order to help them dissect our language. When students encounter a word they don’t know, they use context clues and the word itself. What you see here is an example of notes I would present to students. This example is of a common prefix “se-“ meaning “apart”. When I give notes for these word parts, it’s important to show students the word part “in use”—both visually and textually. We practice these word parts daily through vocabulary games, sign language, and other fun activities. Breaking down words brings our students one step closer to comprehending the text they are reading and one step closer to success! 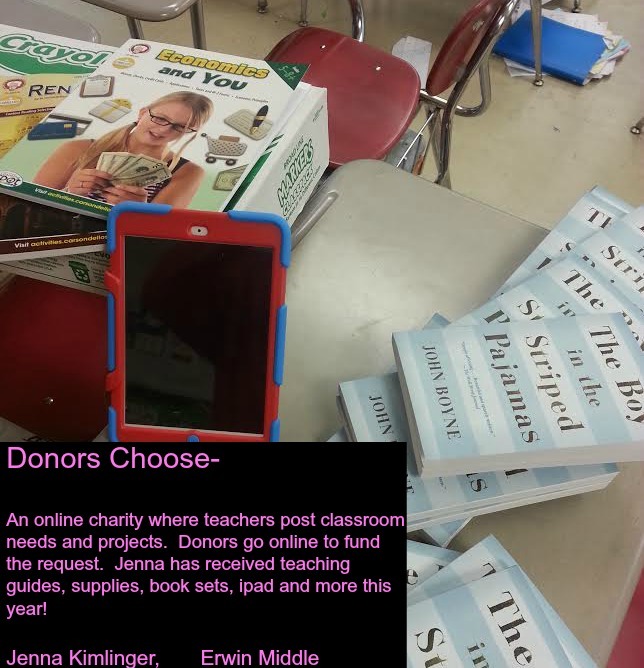 I teach forty-eight students all of which now benefit from the generosity of Donor's Choose. 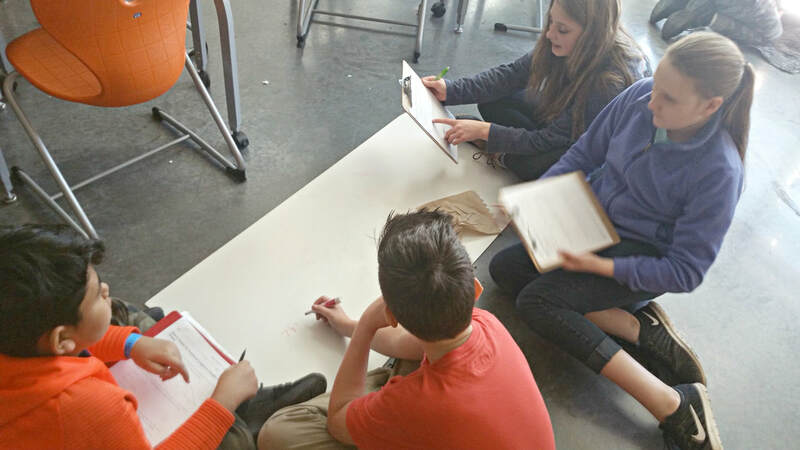 The students rotate in groups every week between the bicycle desks, Hokki Stools, and standing desks. My students are not only engaged but they are active. For eight hours a day, students get to wiggle, pedal, and stand their way towards a healthy education. The kids are not picking on each other, they are not needing to walk around, they are not needing to go explore. They are able to get their activity out and get their work done. They're not sitting stark still for eight hours, instead, they are moving, questioning, and interpreting education in an entirely new way. Thank you, Donor's Choose! I begin each class with something on the board to challenge student thinking; it is a part of our daily warm-up. This example comes from my "Grammar Fail" collection, which is comprised of photos of real-world grammar mistakes from signs, menus, flyers, etc. Students enjoy finding the errors in all of the real-world grammar mistakes. It is always a fun and meaningful way to begin class, and I am able to teach mini lessons on grammar, spelling, and punctuation. Students volunteer at the beginning of class to try to correctly identify the grammar fail. It's gut-wrenching when you ask a student what they're learning about and they reply, "I don't know." So, after being confronted with this issue far too much, I decided the students needed a visualization of their learning. A place where they could go and literally see what they've learned. Therefore, the whiteboard has now become our "mindmap." I move a small magnetic smiley face around the board to literally show the students where we are and what we're learning. Also, we fill out each new square (common core standard) together as we learn that new concept. So when I ask them, "what are we learning about," their eyes all turn to our mind map -- and not one student says, "I don't know." 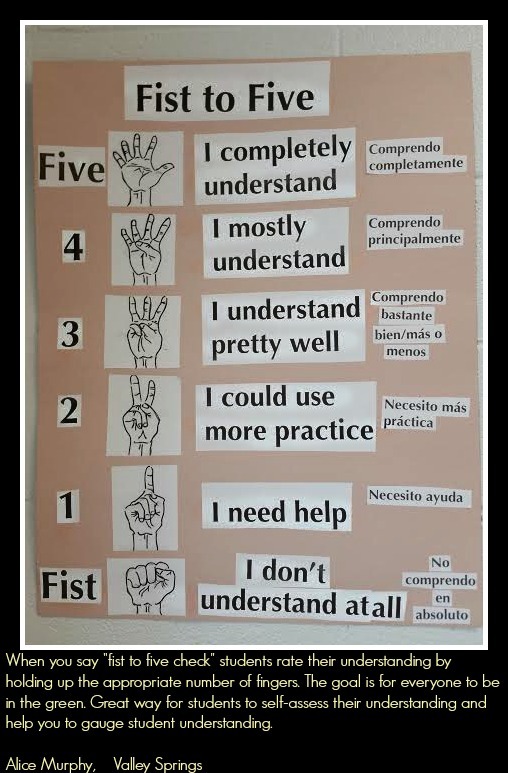 This allows visitors (students and adults) to understand what skill or skills your students have mastered in the displayed work. We Went To College... You Can Too! It is essential that all middle schools begin to prepare students to attend college or other post-secondary educational programs. 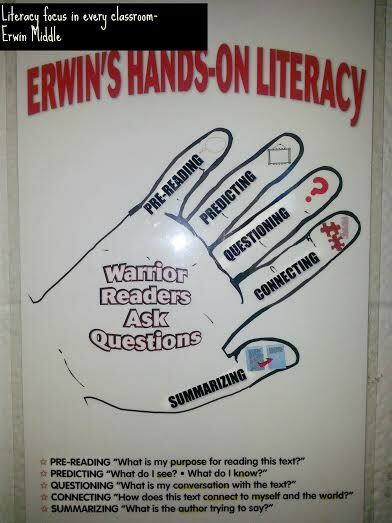 At Erwin Middle, we are trying to develop a college-going culture. 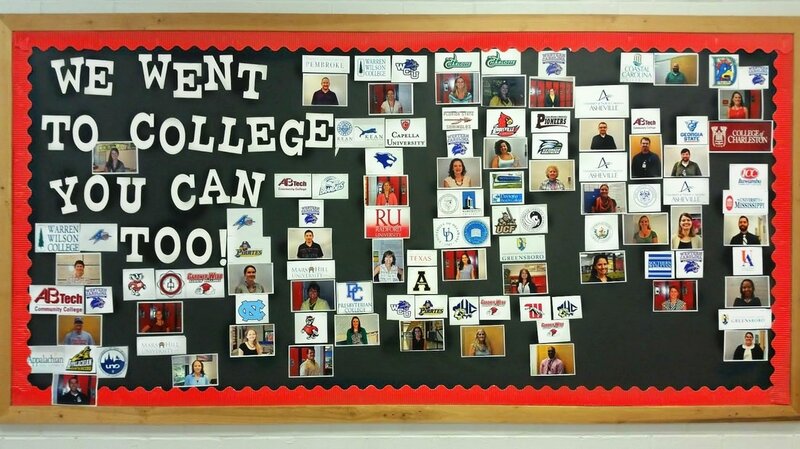 This bulletin board represents our entire faculty and all of the colleges we attented. We created this board in the hopes of sparking conversations with our students and getting them interested in a variety of colleges and universities. On a designated day or days during College Month or Spirit Week, staff members can wear clothing with a college name, mascot, or emblem. Students can also wear college sweatshirts or T-shirts. You can also have teachers post what colleges they attented right outside of their classroom. We are studying infectious diseases, and our science classes have been learning about how diseases spread. The way in which a disease spreads through a population demands the careful collection and analysis of data. When an outbreak of a serious disease occurs, scientists must track down the disease and determine its origin. In this investigation, students simulated the spread of an infectious disease and had to determine the original carrier of the disease. 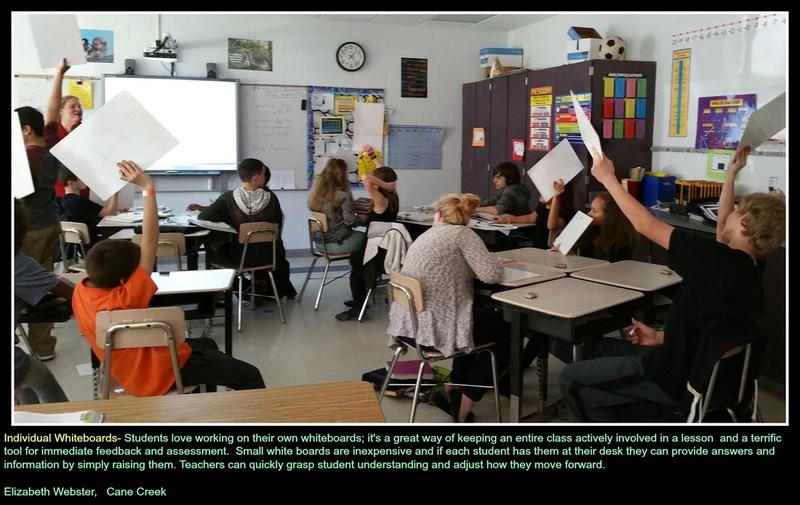 (Picture on the left): This classroom management strategy is centered around each class having the opportunity to earn 5 minutes of free time at the end of class each day. I have found that having a more immediate chance for students to reap the benefits of a smooth, productive class has worked better (as opposed to some weekly/monthly rewards I've tried in the past). 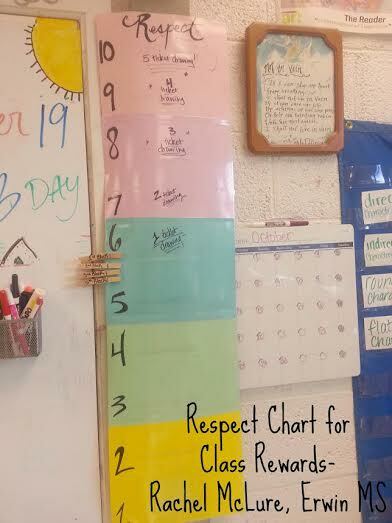 On the board, I use this chart to track the class "stars". Four stars is what they need to earn the 5 min. 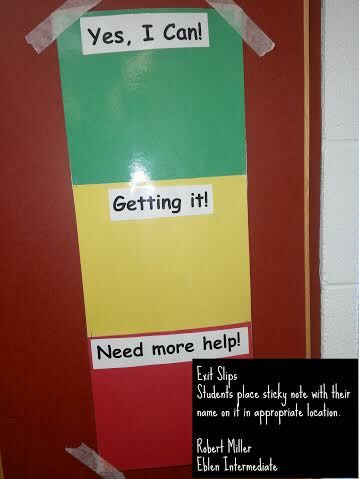 Above the chart, it reminds them the things they need to be doing well to earn the stars. By each class, it reminds them of the time that class will end if the 4 stars are earned. 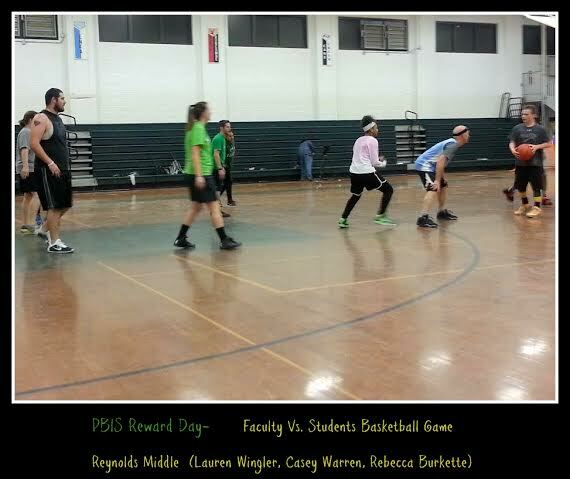 (Picture on right): This is a reward/consequence strategy that I use with each class. Every other Friday they can potentially have 15 minutes of free time at the end of class. Every class starts with 15 minutes. If the class is talking out or misbehaving, I go over to the board and erase a minute without saying a word. Once a minute is erased, the students begin to encourage their classmates to behave so they do not lose anymore free time. 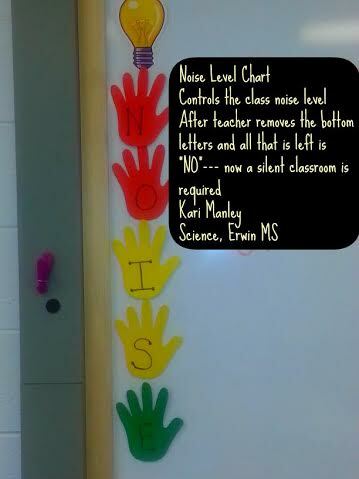 You can also add minutes if the class is demonstrating excellent behavior. I leave the minutes on the board, so it is also a fun competition between the classes. It works really well. 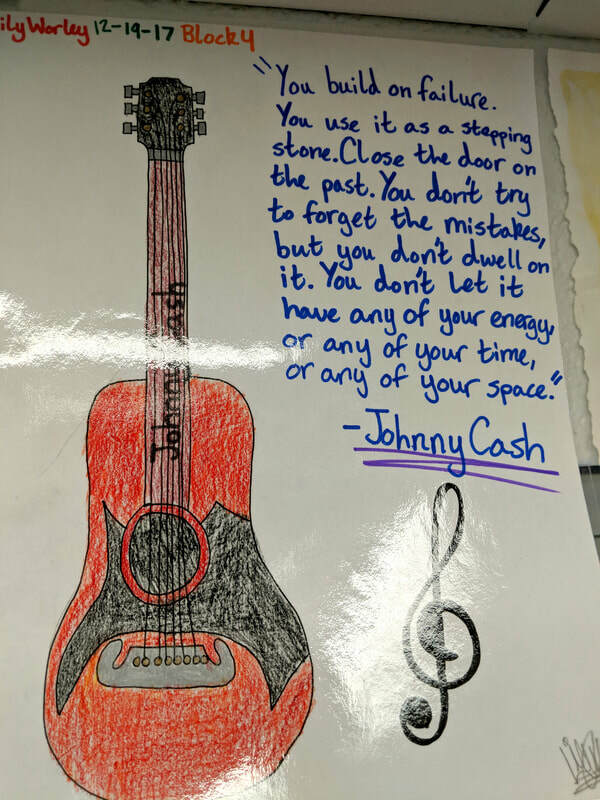 This is a new favorite in our 1:1 classrooms. 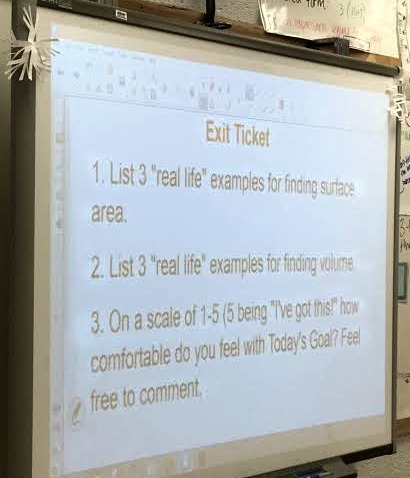 The digital exit ticket provides students an opportunity to demonstrate their learning in a format that takes the classroom into the 21st century. 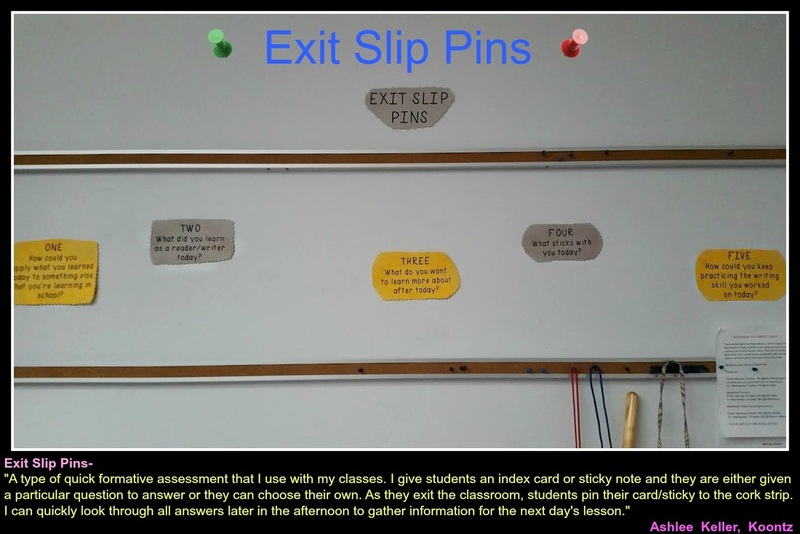 When I create the exit ticket I include an assignment notification that enables students to simply click on the notification to be taken directly to the exit ticket. Canvas will notify me that 16 students in my second block have turned in the exit ticket and alphabetize the responses for each class. I allow students to use their notes so they can provide evidence to support their answers. 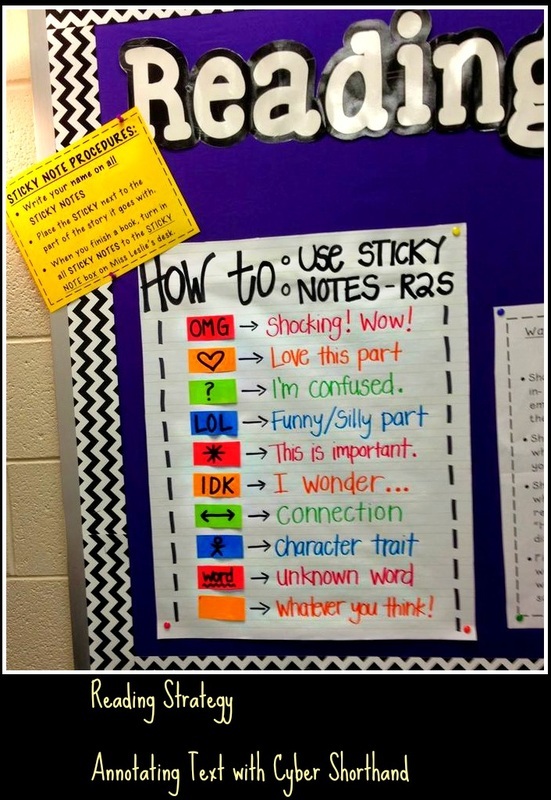 This also encourages students to participate in the note-taking process each day. Assignments can be as simple as one question exit tickets like "what did you learn today?" to complex quizzes that use a combination of multiple choice, short answer, and true/false questions. 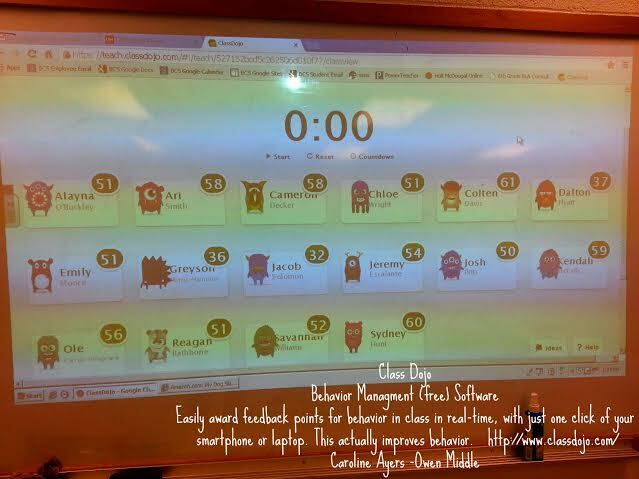 In addition to grading and organizing, I can provide digital feedback individually or to a whole class. Canvas will provide an average score per class which helps me gauge where not only individual students are with the material, but the class as a whole. 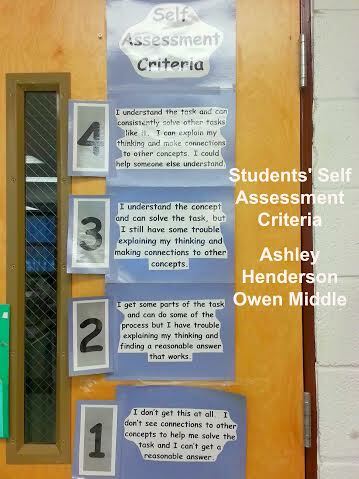 I have realized how critical frequent assessments are to ensuring student understanding. I love this tool!! I love weird and interesting facts! I thought my students would become more engaged and curious about science topics in wanting to find out why these facts are true. From time to time, attention spans run out and you just need students to hang in there for a few more minutes. A great technique is just throwing in an unrelated 'Wow factoid' that gives a 30 second break from the content you are delivering. Students are always checking out my new factoids on the wall and discussing them with their peers. 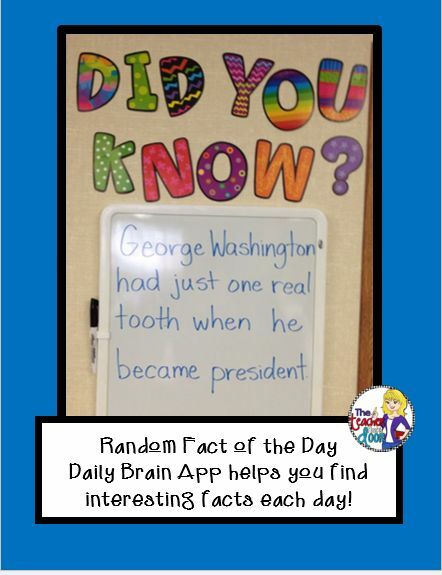 You can also have a "Did You Know" fact of the day to keep class interesting. Researchers, led by The National Association of School Psychologists, have shown that there are benefits to expressing gratitude, even to "counting one's blessings." But doing so takes a bit of practice. When we promote gratitude in our students -- we are giving them a great gift. Teaching children to be grateful can help shift perspective toward greater positive engagement with others and with life. Since gratitude is a learned emotion, I thought creating a Gratitude Board would help foster appreciation in the students and serve as a constant reminder that there is always something to be grateful for. I usually ask them to write down something or someone they are grateful for every 3-4 weeks and then post them all on the wall for the other students to read. It also serves as a great shout-out board for best friends to thank one another for their support. My students really enjoy participating. 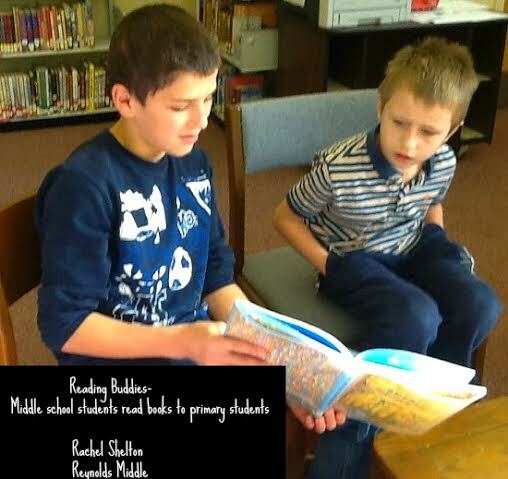 After reading the short story "Ruthless" by William de Mille, students were split into groups of 3 or 4. 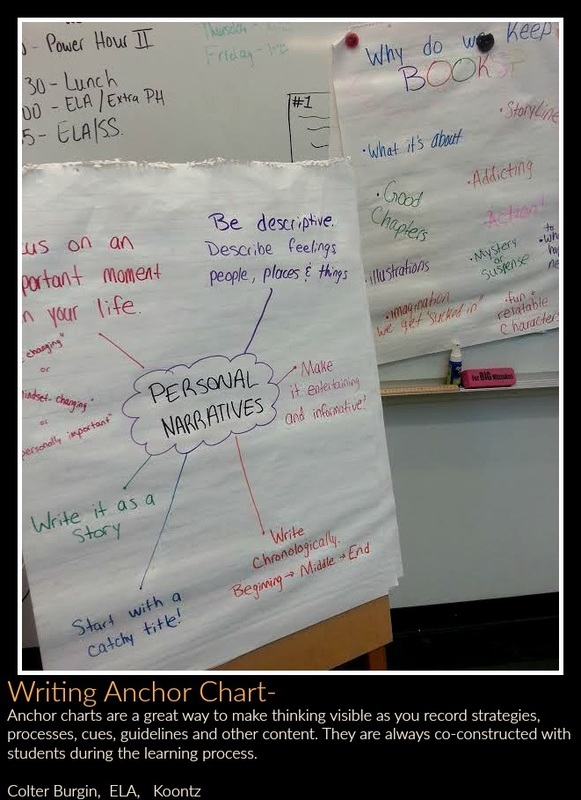 Each group was assigned a possible theme for the story. As a collaborative group, they had to carefully search through the text to find evidence to support their theme. Students had to list the evidence under their assigned theme. After all posters were completed, we hung them around the room and students did a poster/gallery walk to preview and analyze all the other themes and evidence. Finally, students voted on which poster they thought had the most accurate theme and supporting evidence. The winning group got a small prize. With their 1-to-1 devices, students are working collaboratively in teams on the online game Quizlet Live. Students had access to individual white boards so they could work out the math problems together. All teams are assigned a team name and they compete with each other in a race in real time, which makes the learning exciting, competitive, and fun! 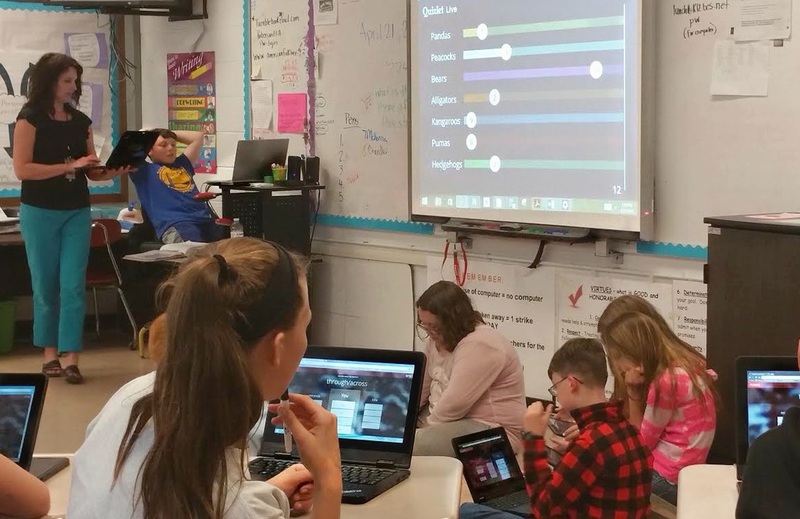 Quizlet Live randomly assigns the students into groups, which keeps the teams fair, always changing, and well-balanced. This game consisted of math review questions before we took a unit test. 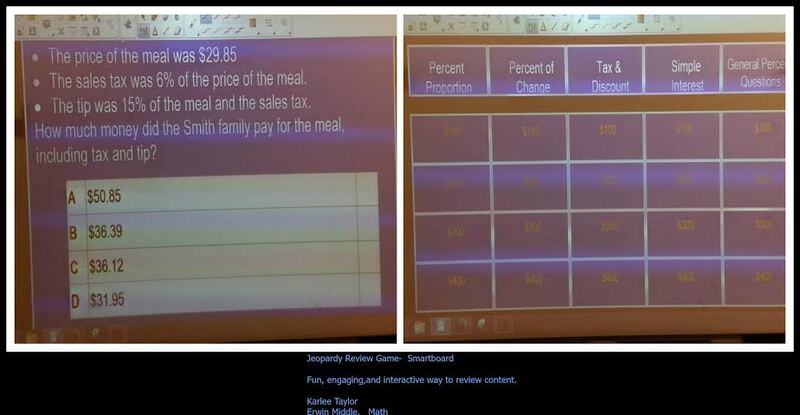 Students worked with a team to solve the problems and select the answer that appeared on one of their screens. Everyone on the team must contribute. Students had to get the question correct to move on to the next question. Whenever they get an incorrect answer they have to go back to the beginning, which encourages accuracy over speed. There are 12 questions that need to be answered correctly in order for a team to win. This is an awesome tool for student engagement, vocabulary and review! 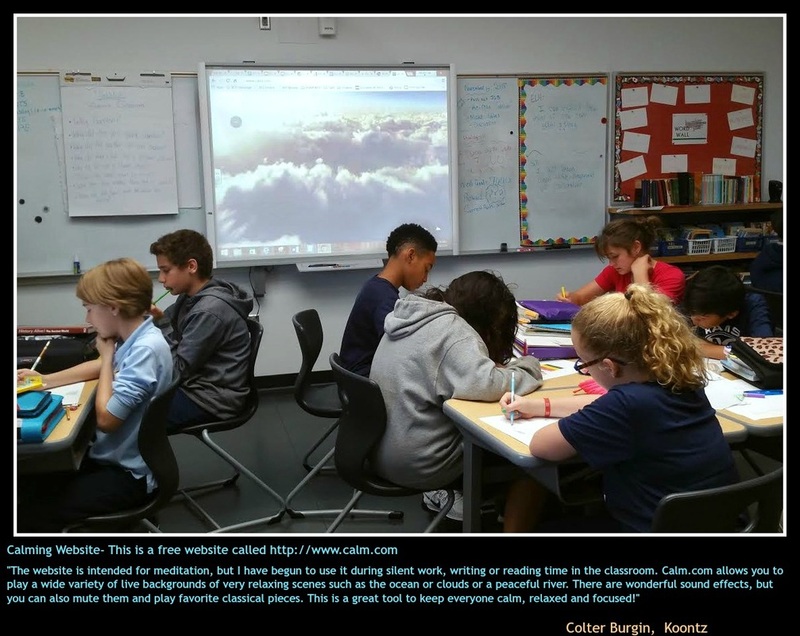 ​My students are reading articles examining the effects of the Columbian Exchange between Columbus and his Men and the Tainos people on the island of Hispanola. Each group is assigned a different reading passage and it is up to them to collect evidence and determine who was guilty of genocide against the Tainos people. They have the opportunity to come up with a compelling argument to determine if Columbus, his men, King Ferdinand and Queen Isabella, or the Tainos themselves were at fault and responsible for the death of thousands of indigenous people on the island of Hispanola. At the end of this lesson, students can role play in the form of a trial to determine who is responsible for the death of millions of Taínos on the island of Hispaniola in the late 15th century. For us, this occurs in a fish bowl style discussion with one person from each group in the middle of the circle. The group members can switch in and out depending on what evidence they are bringing to the table or different POVs they would like to consider. It is amazing how engaged students become to not only learn the truth but also be able to defend themselves using the textual evidence provided. 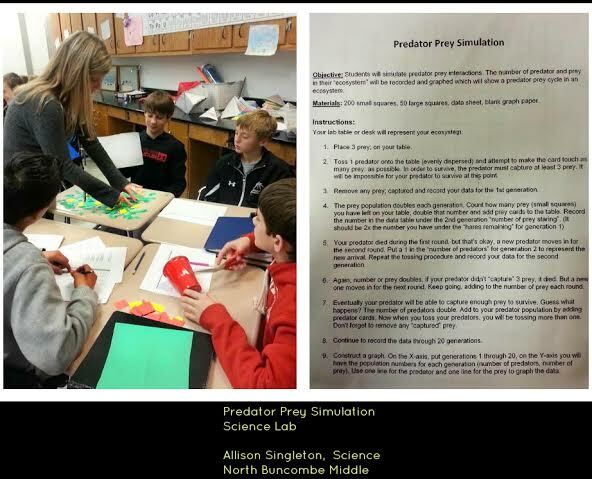 This case allows students to use higher level thinking skills to come to their own conclusions. That handout is a standard weekly warm up that seventh grade ELA teachers use. These daily warm-ups provide a consistent start to the beginning of each class. 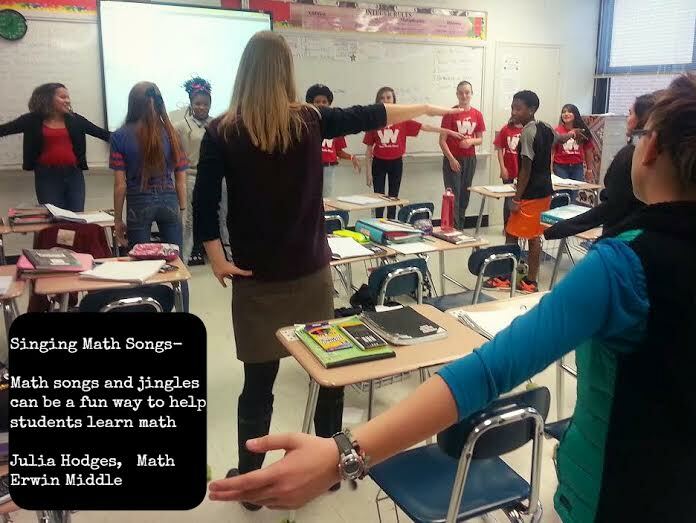 Students begin the warm-up right when they enter the classroom, which makes for a smooth and quick transition. They will glue these into their notebooks every Monday. We grade them for completion and effort, no focus on grammar or spelling. We use a different poem each week that has some correlation to our current theme. The first and last days of each week are repeated throughout the year. The other days of the week vary according to what the students are currently studying. Interpreting and analyzing poeity is a difficult skill for most students, so this allows access to a variety of poetry for our students. When students enter the classroom, they immediately come to the smartboard and check their own avatar name. This is a fun, quick, and fast way to take attendance each day. You can also easily keep up with tardees with this feature. Class Dojo is a free web, iOS, and android app that is designed to help with classroom management, student engagement, and community building. 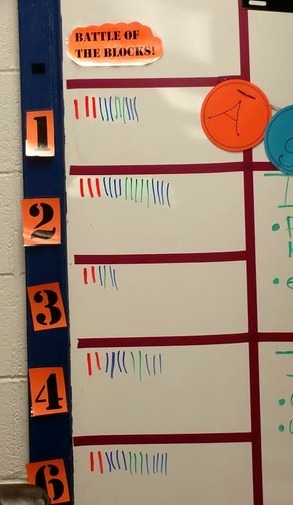 It's an excellent tool to keep track of student behavior, attendance, and to connect with parents. Class Dojo also has a "Random"feature where it selects random students for you to call on so you can call on all students equally. 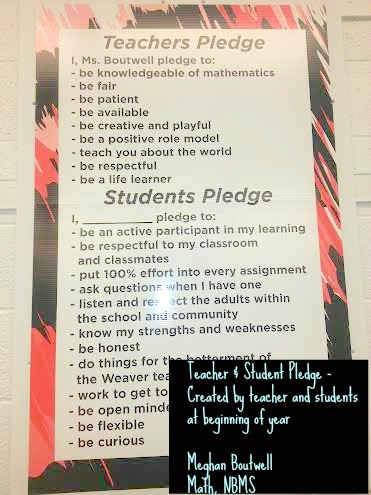 This is our class mission statement that stays posted in the front of our classroom for the entire year. This serves as a daily reminder of what is expected out of my students and what they can expect from me. We create this mission statement together and then each of us sign it. When creating a class mission statement, it needs to be created as a team. Ensure that your students see you as being part of the team and not as a leader. Discuss why it is important to make a class mission statement (working as a team towards a common goal – learning new things, a sense of pride, developing team skills, etc.). Some actions might relate to academics, work habits and behavior. You may choose to write these as bullet points or turn them into sentences. It’s a good idea to keep it short… something the students can remember. 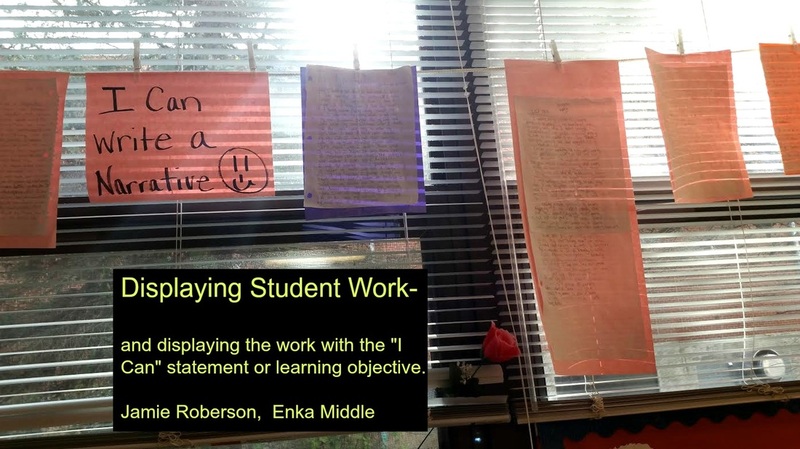 A classroom mission statement allows class members to review values and ensures a common language on a daily basis. For each set of instructions, write them ahead of time on the board or have a slide in your PowerPoint or Prezi. If you are relying on giving oral directions only, think of those students (and adults) that have poor listening skills: "What are we doing again?" 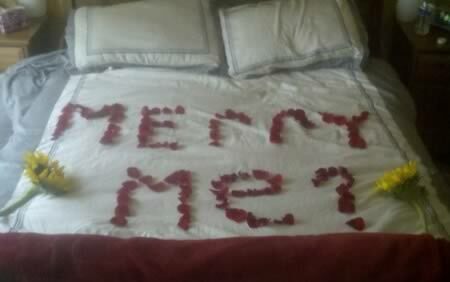 What do we do after this?" "What did he/she say to do?" The energy and time you take to make the instructions visible will pay off. Writing out the directions for students helps keep the pace uninterrupted. 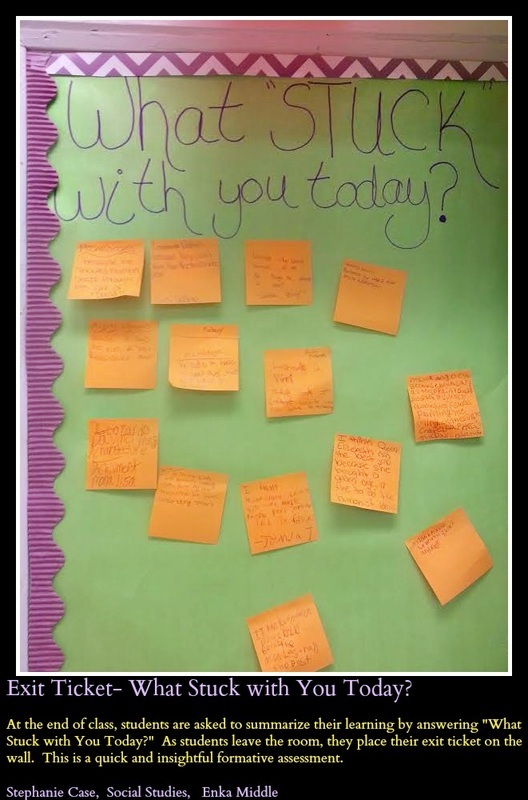 Students from each class are encouraged to write each other "shout outs" that highlight positive behavior in the classroom or elsewhere in the school. 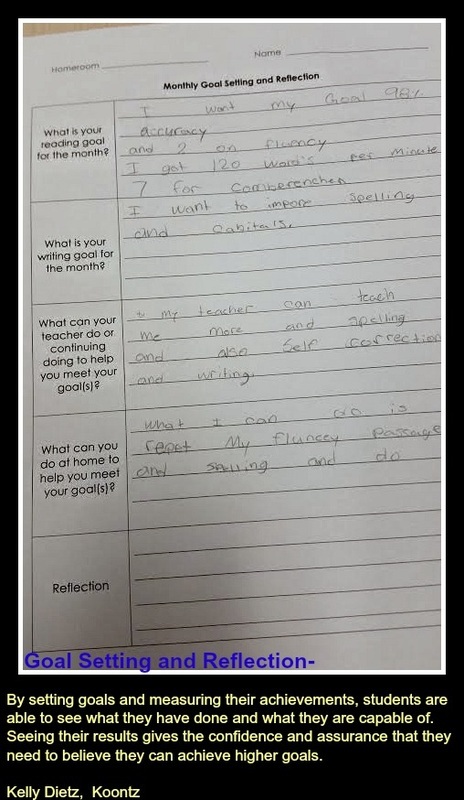 I provide students with examples of many "reasons to shout" including: helped me understand something, cleans without being told, makes good choices, always follows directions, shows kindness, always on time, always on task, has a positive attitude, encourages others, comes to class prepared, etc. Students put the the shout-out in the correct block shoe holder that I have the "shouted out" student in. Students who receive a shout-out get a wristband for the day (school-wide reward) and students who write a shout-out get points on Class Dojo. The "Shout-Out" bulletin board serves as a visual reminder of all the positive behavior going on in our classroom each week. These “shout outs” are little notes that can be awarded to students as praise or positive reinforcement for excelling academically and/or behaviorally. You may want to announce "shout outs" at the start or end of class, at the start or end of the week, or just slip the student the note (not everyone enjoys being recognized publicly). This shout-out board is a part of my PBIS system to help build a positive community in our classroom. Each week we have a vocabulary list of 10 words. 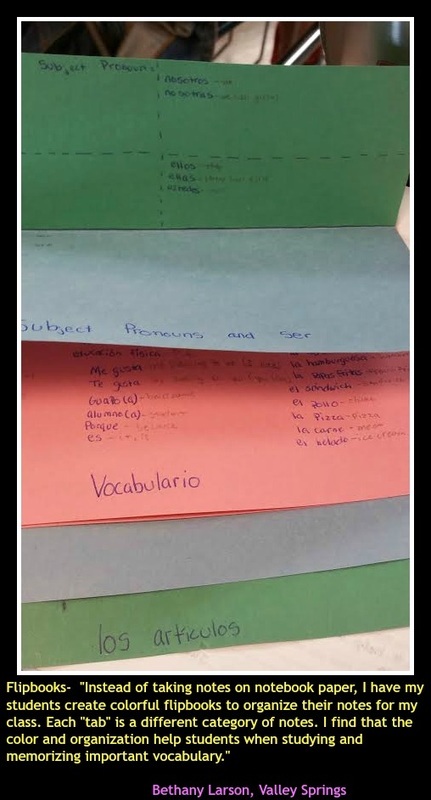 Students are taught the words and definitions and copy them onto note cards, which feature visual images, the vocabulary words, and the definition (you can also include synonyms and antonyms). The front of the card has the vocabulary word and the visual illustration and the back of the card has the definition. Students study and interact with these cards throughout the unit. The class selects the best flashcards to use in our own classroom word wall for each particular unit. 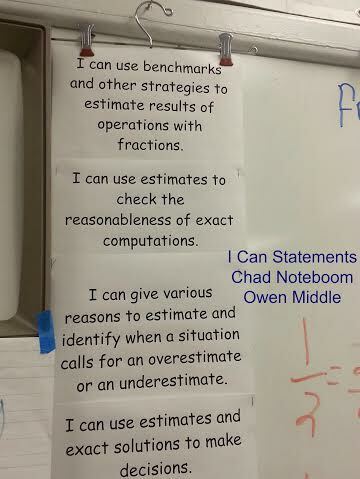 We can refer back to these words and units all throughout the year. Teaching vocabulary is one of the most important components to improve students’ understanding and comprehension. Because flashcards are interactive, the students can shuffle the cards so that the students do not always view them in the same order. They can remove the cards they have mastered while still working on other definitions, so that the students are the ones who are accessing what they know. Additionally, flashcards are suited to most content areas so that students are learning a study skill that will help them across the curriculum. Each day that we have a new learning target students will write down the target on one side of the index card. After the target has been taught the students are to answer the learning target on the back as if it were a question. Sometimes this is their exit ticket out of the classroom and sometimes I check the cards as a homework assignment. This quick formative assessment gives me immediate feedback so that I can adjust my instruction for the next day. 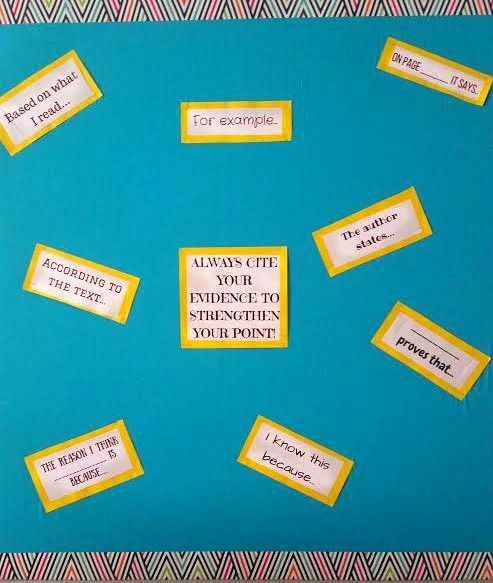 The students keep these Learning Target cards and use them as a study tool. Pacing a lesson so it's nearly seamless takes expertise and practice -- and can be one of the greatest challenges for new teachers. The true art of pacing lies in creating a sense of urgency and also not leaving your students in the dust. 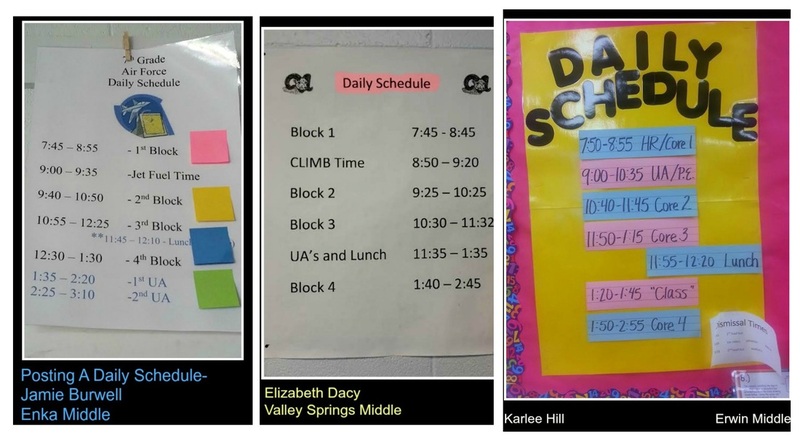 Posting estimated times beside each activity in the daily agenda can help create that "we are on the clock" feeling -- while moving steadily ahead providing ample wait/think time along the way. A timer is also a good tool for keeping the pace flowing. One way to avoid a clunky lesson pace is to make sure the learners know exactly what they are learning and doing for the day. 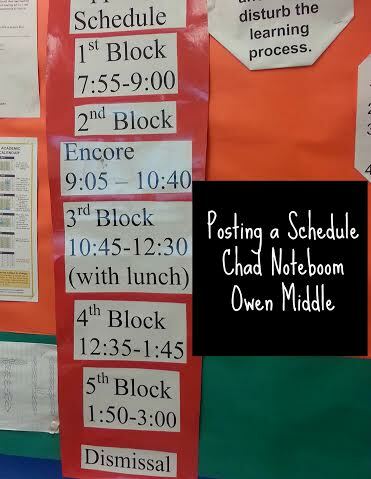 Posting times will create a sense of urgency that will minimize down-time in your classroom. 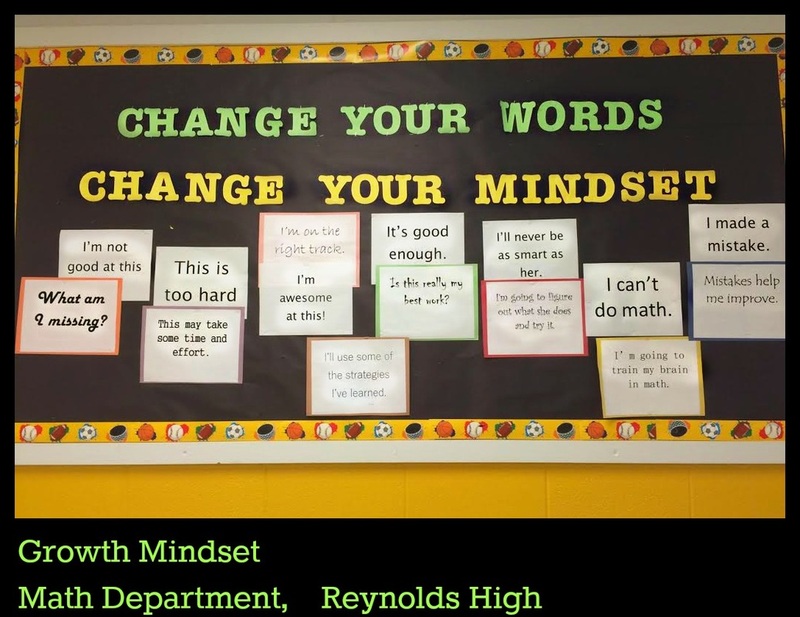 The purpose of this wall is for students to see the type of vocabulary they will encounter in a math word problem and be able to recognize the operation that the word implies. 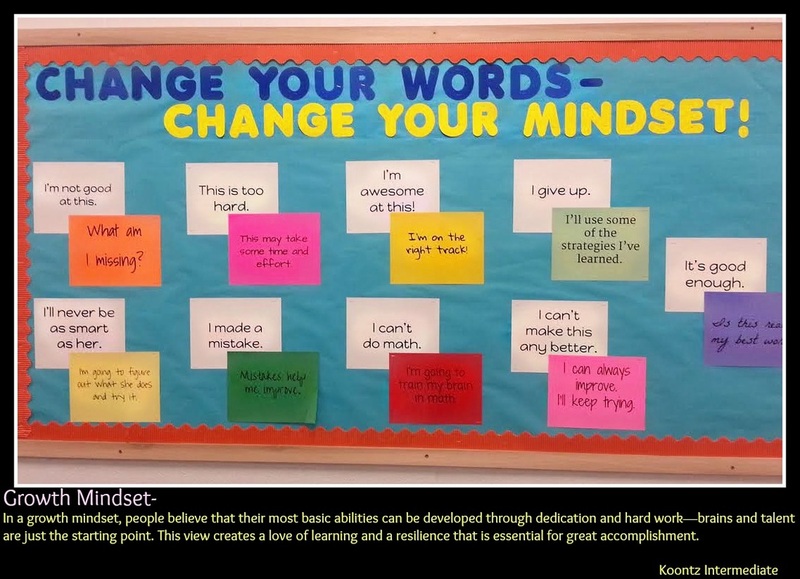 Having it on a bulletin board is a visual reminder of that vocabulary. "This is a section of our classroom where students go when they have been absent. 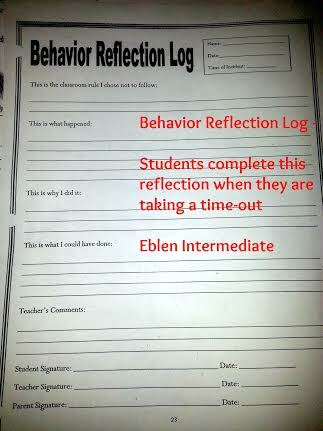 The students are able to write down the agenda from the day they were absent and pick up any missed worksheets. Every day, I write down the agenda on the calendar (or assign a student to do it) and place all the hand-outs in the appropriate folder for each block. 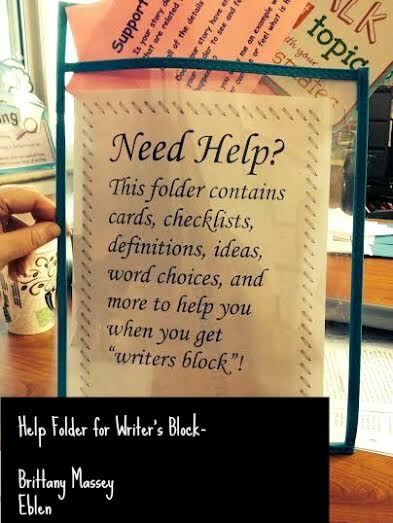 This helps all of us stay organized." 1. Think of a staff member who has been doing a fabulous job lately or someone who goes the extra mile. 2. Grab a stick note and write them a compliment. 3. 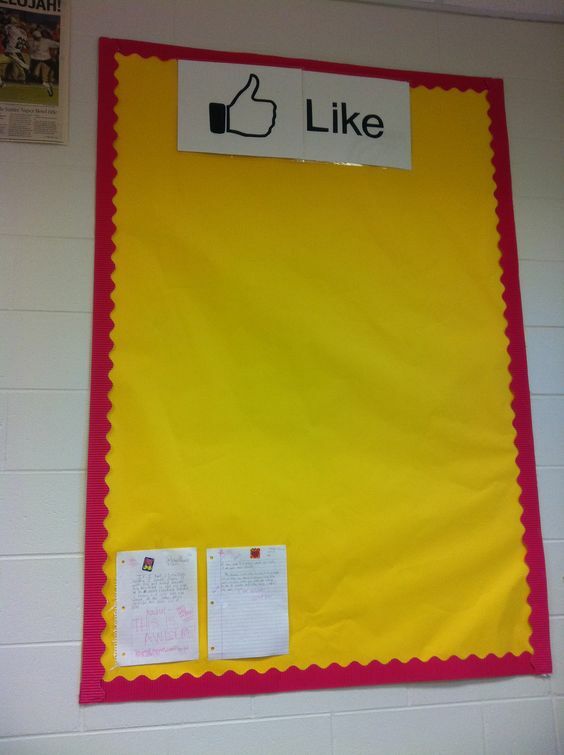 Post your shout-out on the board. 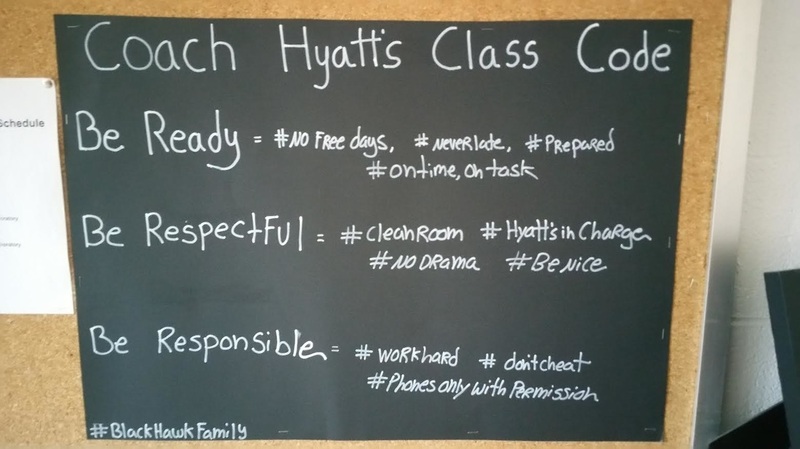 Students created hashtags to go along with the classroom rules/expectations. "At the beginning of the year, I asked students to write about their very favorite book. They give a brief synopsis, explain why it's their favorite, tell how they heard about it, etc. Then they draw their own "spine" for the book. We cut out the "spines" and put them on a "bookshelf" bulletin board. 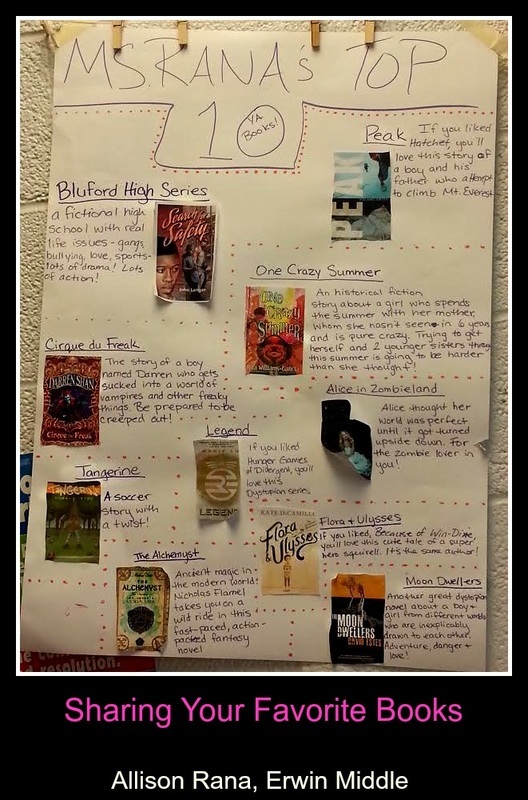 This encourages other students in the class to explore a variety of books that have been promoted by their own peers. 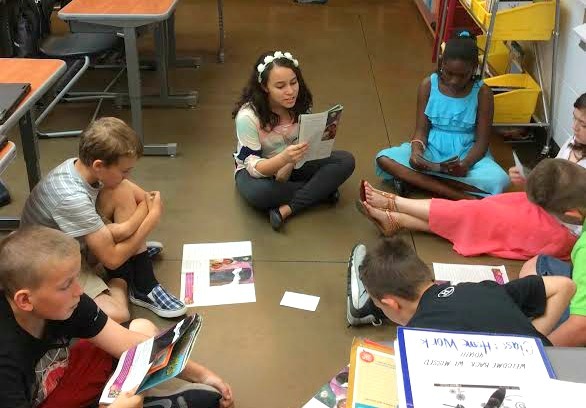 It is an effective way to kick-off the year by building a community of readers." 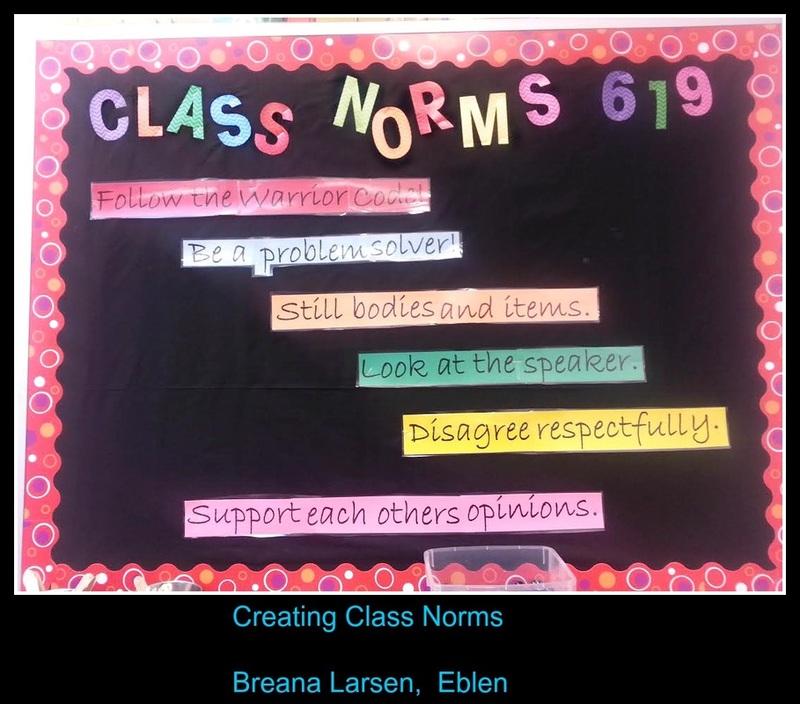 "Students were given an assignment where they were to talk as a table group about group norms. Students came up with their own set of things they like and dislike when it comes to working in groups. Once they had brainstormed, discussed at their table, and had written their ideas on the paper, we had a whole-class discussion about group work. We decided as a class what we thought was important and agreed to follow these norms when we work in groups. 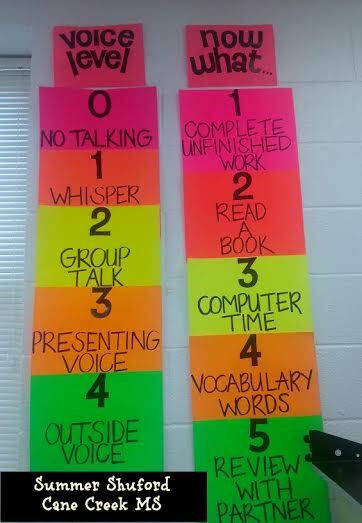 When students are getting off task during group work, I will remind them of the norms that we established together. 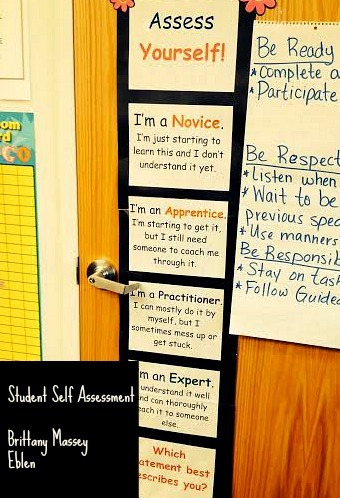 These norms stay displayed in the classroom." 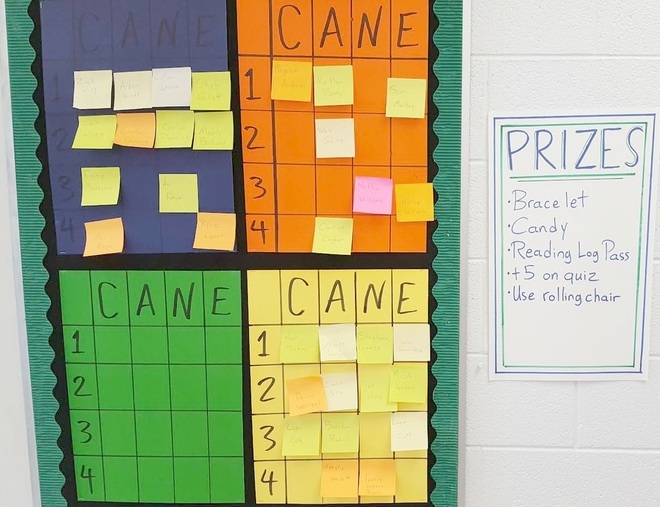 "Incorporating a friendly class versus class challenge, such as "Battle of the Blocks" helps the students work together towards a class reward. 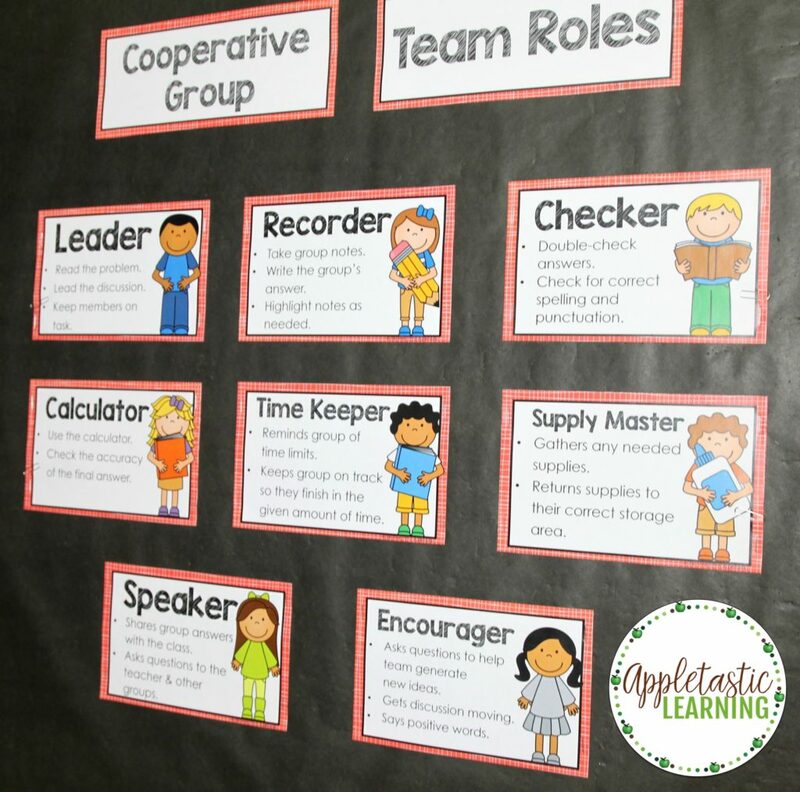 By having the whole class work as a team, it builds class community and is an effective behavior management system. 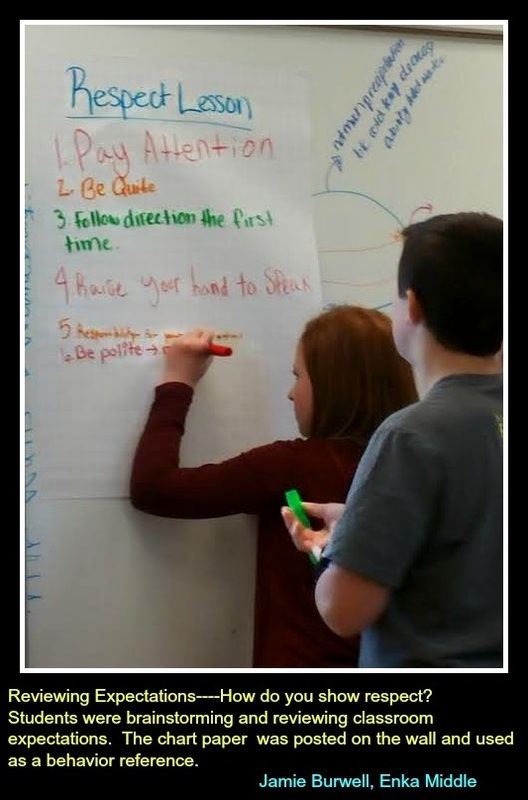 When students are working as they should and following directions, points are added, but when class behavior is challenging, points are taken off. 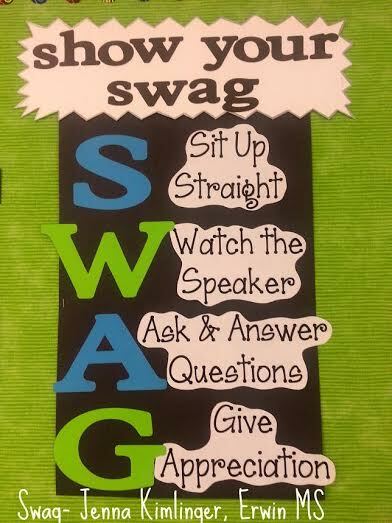 Every week, the class with the most points gets rewarded with a homework pass, snack/drink pass, social time, free seating, device time, or another reward." 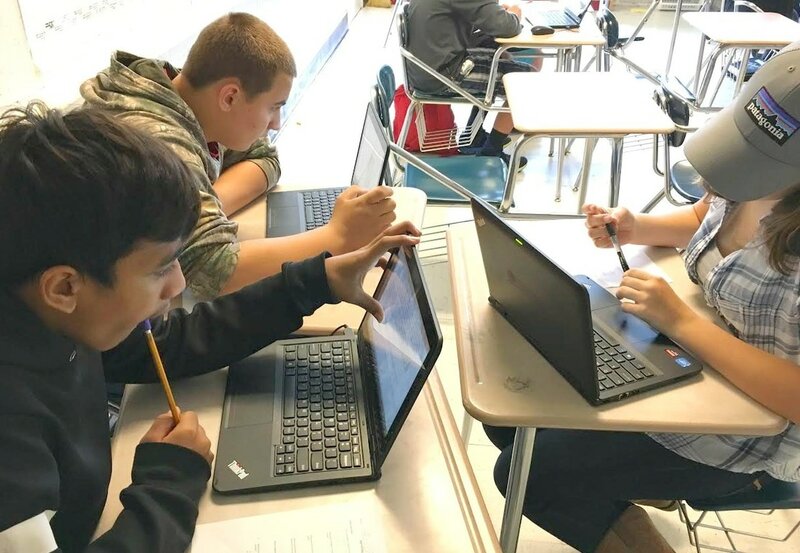 "Analyzing documents and citing text is a daily task in our 7th Grade Social Studies class, but sometimes students lack confidence in their answers and analysis. Using these sentence stems students can back up their analysis with text-based evidence. As our class works throughout the year analyzing documents the empty spaces on the board will be filled with student examples of citing their evidence." 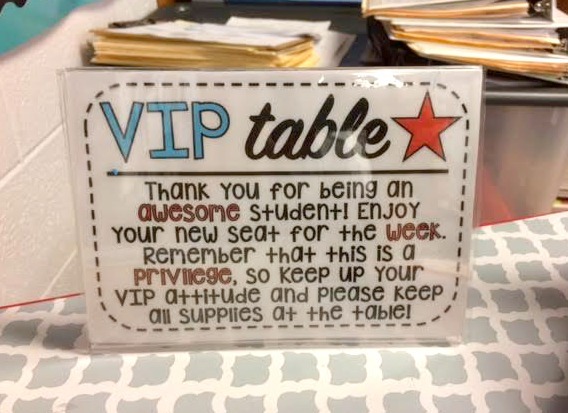 Students get to sit at the Student VIP Desk as a privilege for having demonstrated exemplary behavior. Each week the students in each of her three social studies classes vote on a student who will get to sit at the VIP Desk for the next week. Their names are also listed on the door to the classroom as being in the Student Spotlight. 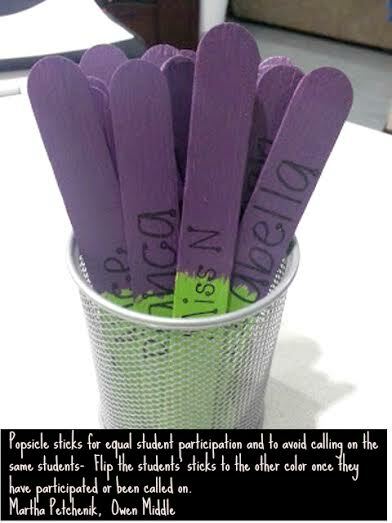 This is a great way to encourage and reward excellent behavior. Kids are more productive and spend more time on task when they can move! Bouncy Bands are a heavy-duty solid rubber bungee-like cord that attach to the legs of a chair or desk to allow kids to discretely exercise their legs while sitting. Bouncy Bands® can be used as a self-regulation tool in the classroom to help kids with anxiety. 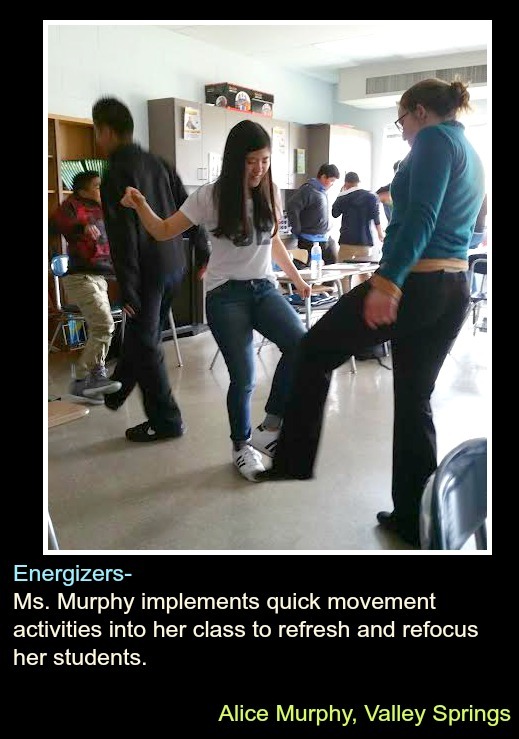 The kinesthetic experience can aid in focus and attention to promote positive interactions and engagement in the classroom. Inclusion in the classroom can be honed with Bouncy Bands® for children of all abilities that benefit from kinesthetic/tactile learning. Physical health like circulation and blood pressure can improve when fidgeting with Bouncy Bands®. Bouncy Bands can be a huge help for AHDH students maintaining focus during school and other quiet times. 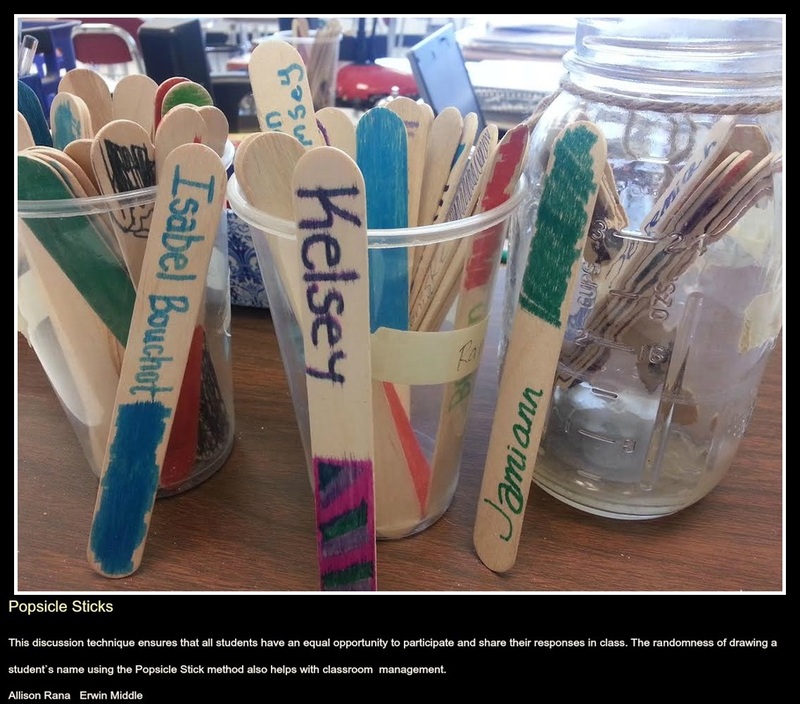 "Whenever I see students exhibiting a positive behavior, I put their name on a sticky note and let them post it anywhere on the Cane Board. Once the board is full, we do a drawing and pick a few spaces at random. The students who have their name on the space called (ex: N1) get to choose a prize. Then we clear the board and start again. This is a great way to encourage and reward positive behavior. I got this idea from my co-teacher, Ariel Warden." "Owen Middle School Strings received a grant in the amount of $10,000 from the Black Mountain - Swannanoa Endowment Fund to purchase instruments and equipment for the strings students of Owen Middle School. Many students who wanted to take the class could not afford to rent or purchase instruments. We are excited about receiving this grant because it will allow each student who wants to play to have their own instrument. This will allow students to take their instruments home at night in order to practice. 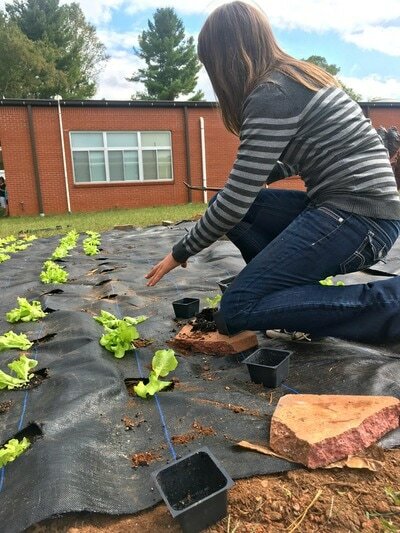 We also hope that receiving this kind of support for the program will eventually lead to year-long string programs in Buncombe County." Each poster looks like cell phone bars, so students are able to make the connection to signal strength. All terms are verbs from Bloom's Taxonomy, grouped thematically under a main term- Analyze, Apply, Understand, and Remember. If I assign students something that asks them to infer, we find the term 'infer' on the ANALYZE poster. We briefly discuss what we will need to do based on the verbs there, and look at the signal strength graphic for visual aid. It continually makes us strive to be teaching and learning in the highest levels of Bloom's everyday. In this lesson, students are asked to think about colors, while imagining what they taste, feel, smell, sound, and look like (studying imagery). The students were allowed to select a color, then they used that color to come up with examples for each of the five senses. We combined everyone's color poem to create a large color poem that we displayed in the hallway. The poem was created with paint sample sheets. With their 1-to-1 devices, students are working collaboratively in teams on the vocabulary game Quizlet. Students work together to find the term that matches the definition. Everyone on the team must contribute. All teams are assigned a team name and they compete with each other in real time, which makes the learning exciting and fun! These tools are designed for the digital age, not just replacing paper predecessors (flashcards, matching games, etc), but using the best of new mobile and audio technologies to create new kinds of learning and engagement. In small groups, students are reading a Reader's Theater story from Storyworks Scholastic. Reader's Theater is a strategy that combines reading practice and performing. Reader's Theater allows children the luxury of lingering over a story; acting it out many times so they come to understand all its nuances. Its goal is to enhance students' reading skills and confidence by having them practice reading with a purpose. Reader's Theater gives students a real reason to read aloud. "In our Title I reading class, we read texts about people and events from all different parts of the world. While my students were gaining some global awareness by simply hearing about these different places, it really helped them to gain a better understanding when they started mapping the places on our global map. How do the ideas in this text relate to the larger world? This also allows me to squeeze a few minutes of social studies instruction in to a literacy lesson." ​Students use emoticons to annotate a reading passage. 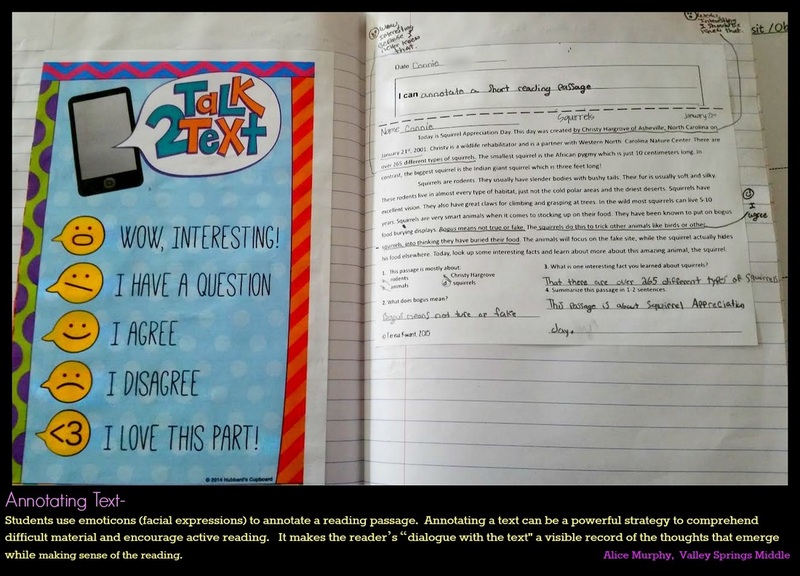 Annotating a text can be a powerful strategy to comprehend difficult material and encourage active reading. It makes the reader's dialogue with the text a visible record of the thoughts that emerge.